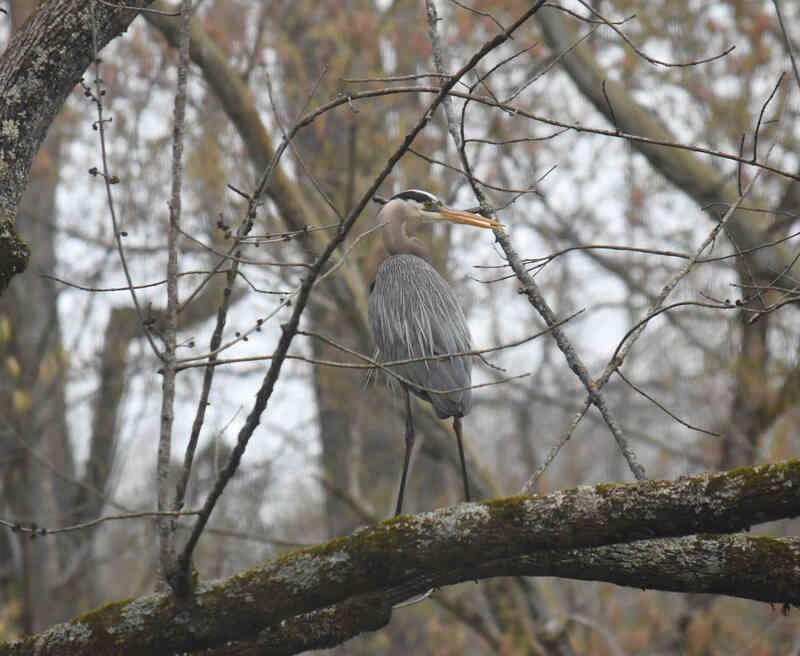 I poked around here all winter, then spring came (according to the calendar) and things got busy. Over 3 weekends between March 22 and April 9, I spent 6 full days driving. That’s getting a bit crazy. 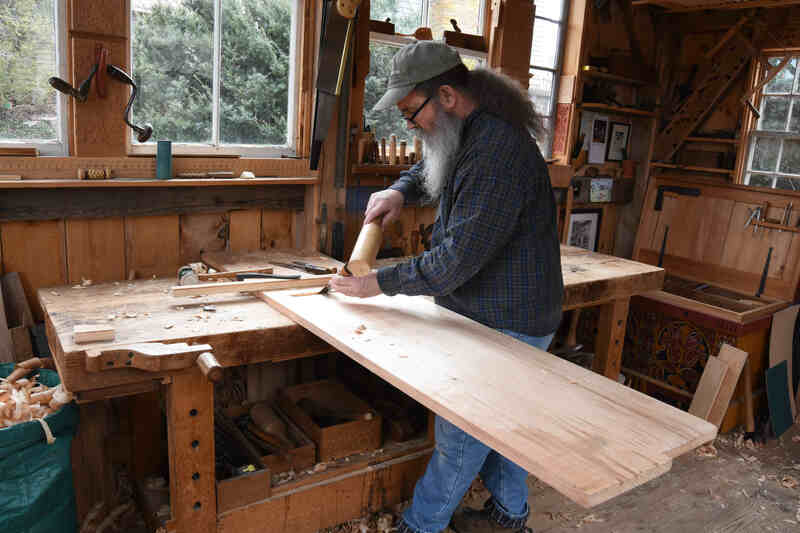 The 2nd leg of that trip was my annual trip to Roy Underhill’s Woodwright’s School. Like always, it was worth the long haul. Here’s pictures. Because I’m going to be in the car for hours & hours anyway, I take the scenic route. 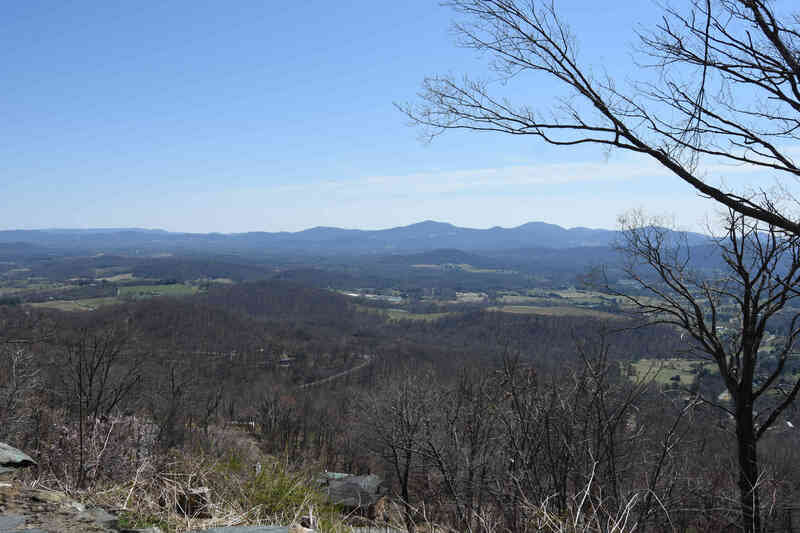 I hate I-95, so here’s a leg-stretching stop among the Blue Ridge Mountains in Virginia. 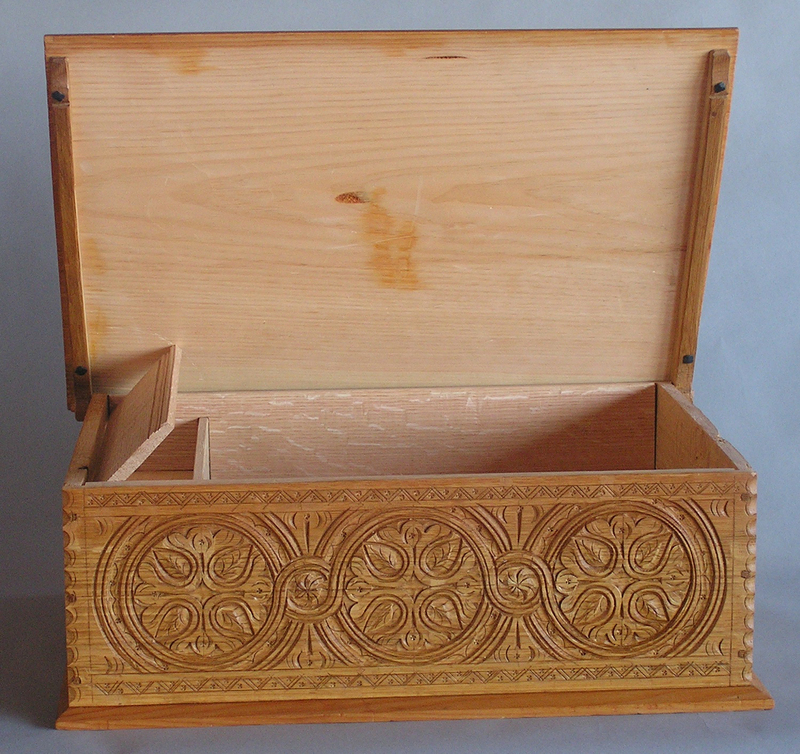 The project was an oak carved box. 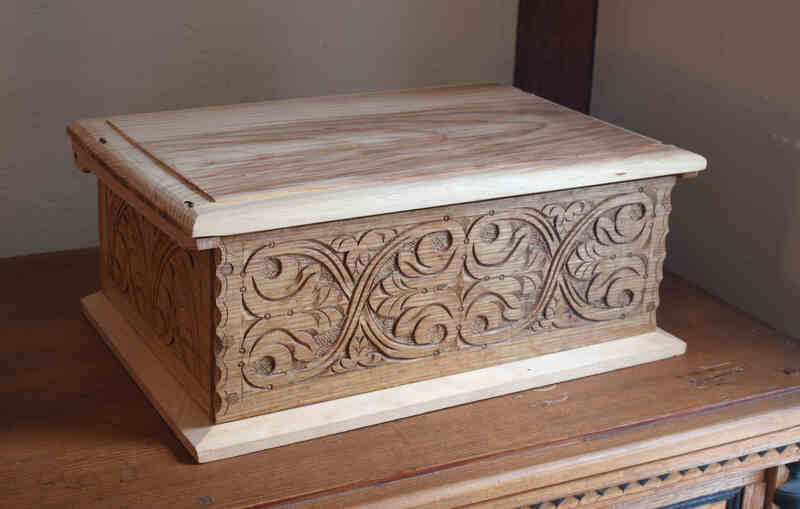 We used quartersawn red oak, with white pine lids and bottoms. 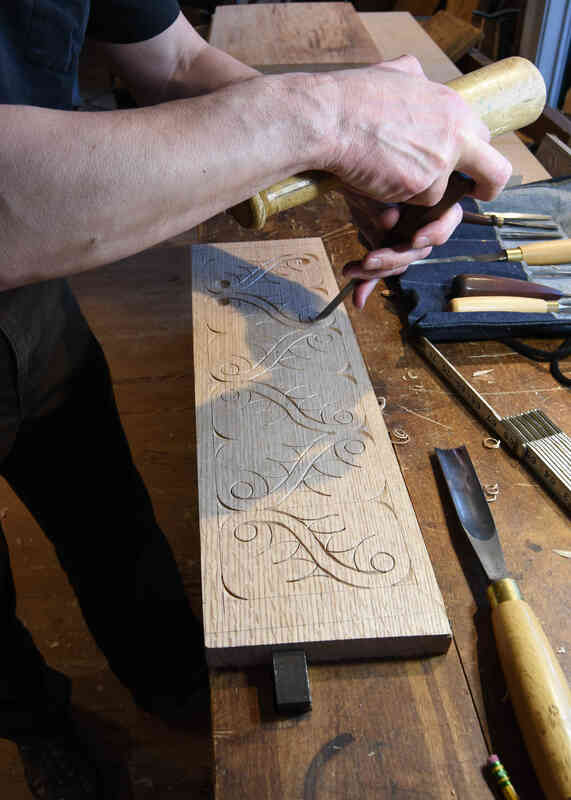 Here’s Paul, carving his box front. On his messy bench, like everyone else’s. It made me come home & clean my shop. Another box front off to a great start. 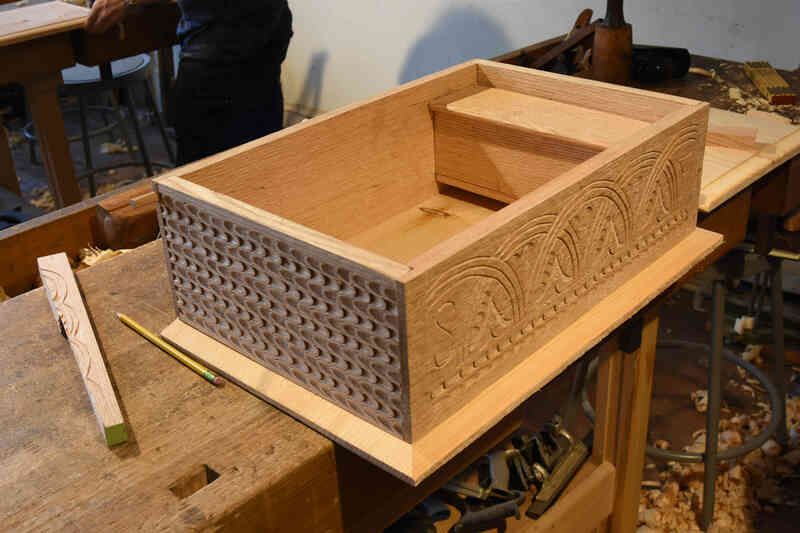 Carving the box fronts comes after a full day of practice carving. Our host had some saw sharpening that needed doing. Plenty of light out here. 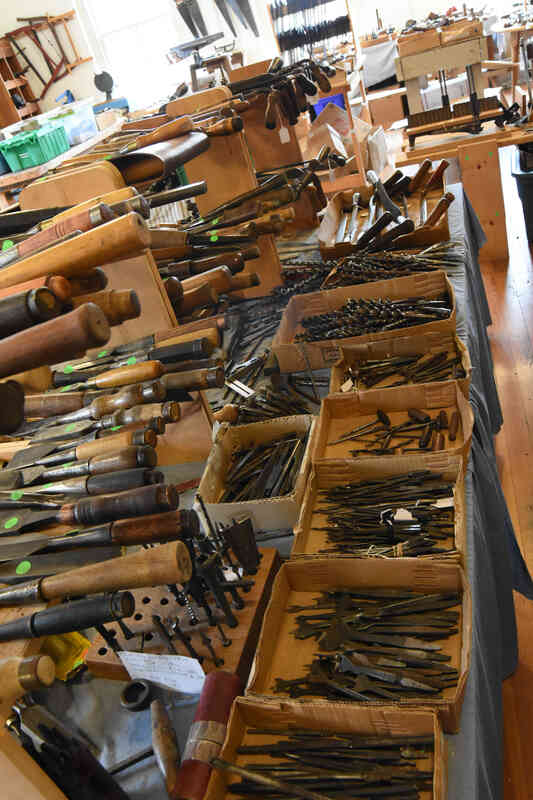 No trip to Roy’s is complete without a stop or two upstairs at Ed Lebetkin’s tool store. I got out mostly unscathed, I didn’t need a box to haul my tools out like many do. I warned them that fitting the till is the fussiest part of making this box. They were not disappointed. It was fussy. 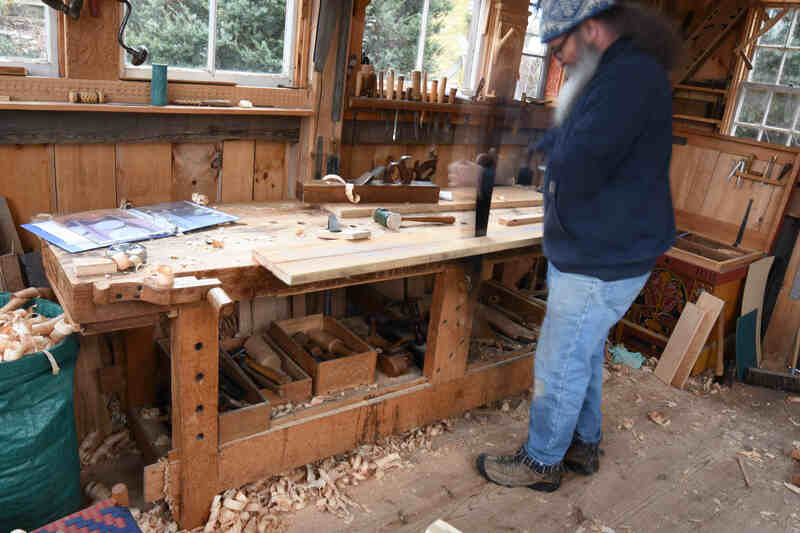 Here’s Scott’s wild carving and a deep till. 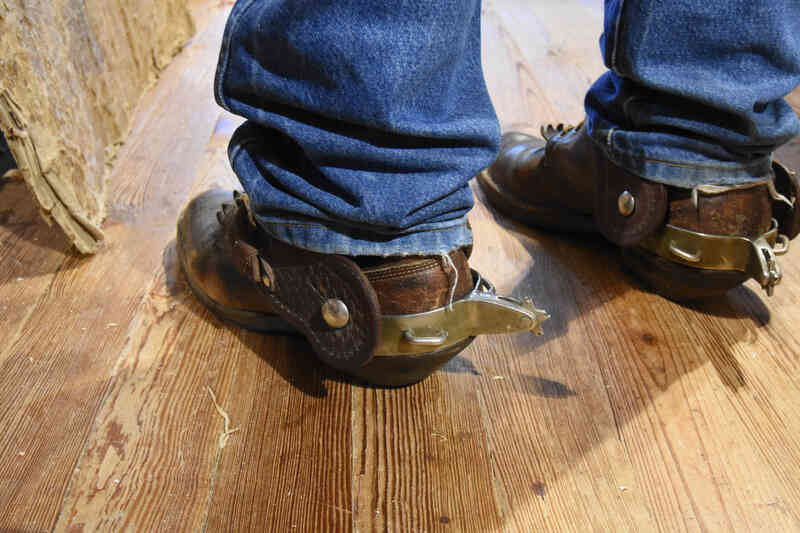 I’ve had students come to class barefoot, in sandals, flip-flops, etc – but never in spurs. Something new…I had to look up where Montana is, it’s way up there. Things kept getting busier and busier as the week went on. That’s the point, I guess. 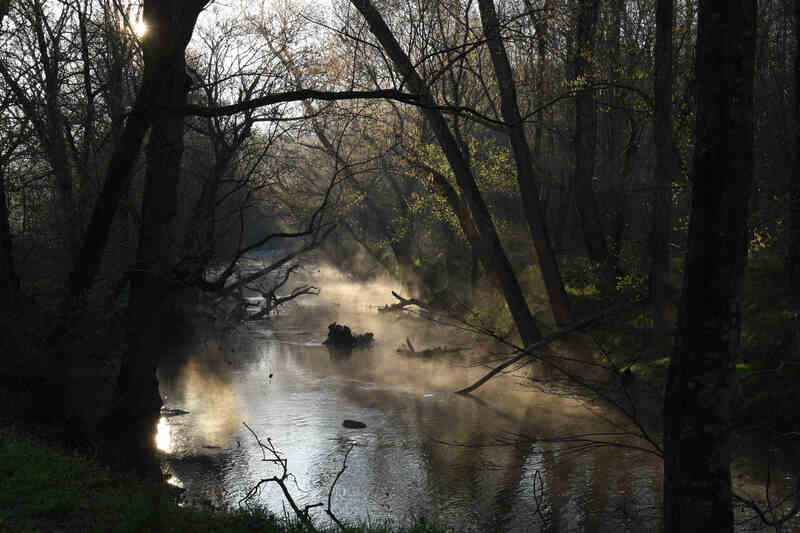 The mornings weren’t great for birding, but some nice views down the creek at one point. 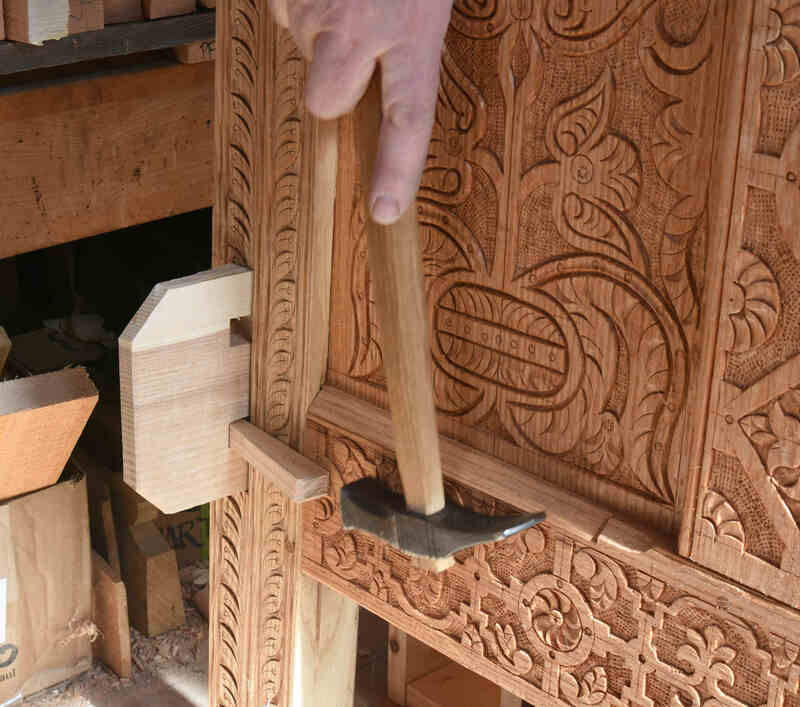 The new joinery book features making three carved boxes in detail. 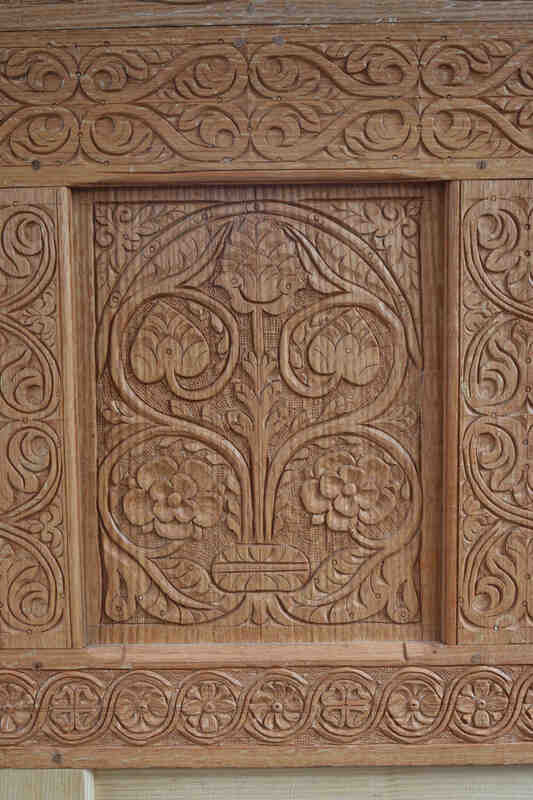 There’s others shown incidentally in the carving section. But I’ve made over 100 of them I imagine. Here’s some from various years, most of these are not in the book. 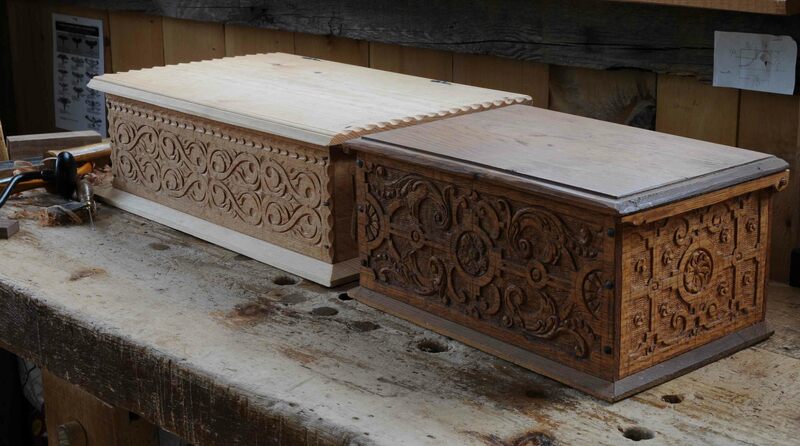 These are all scattered to the four winds; but I’m always happy to make carved oak boxes for customers. 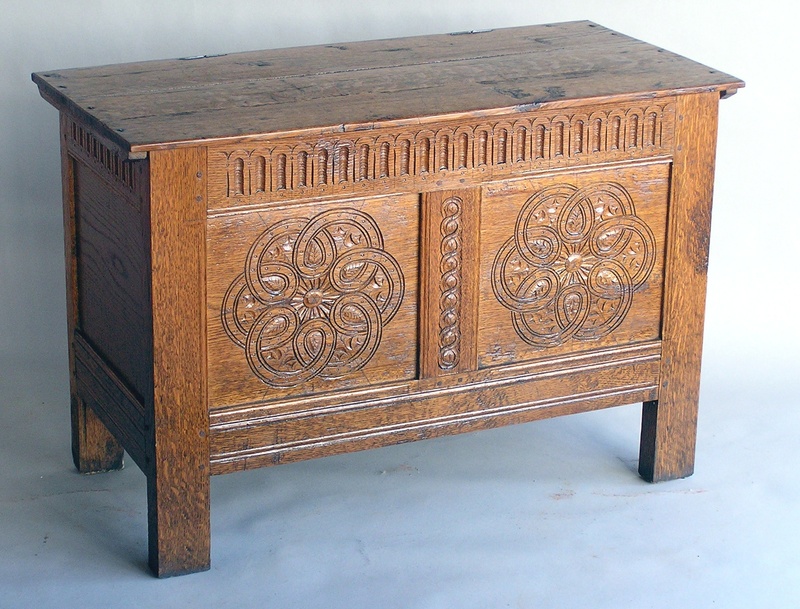 This one is mostly made-up, but the carving pattern is copied from a walnut box in Victor Chinnery’s book Oak Furniture: the British Tradition. I really like this pattern, usually I do it on a pretty wide piece of wood, maybe 7″ high. 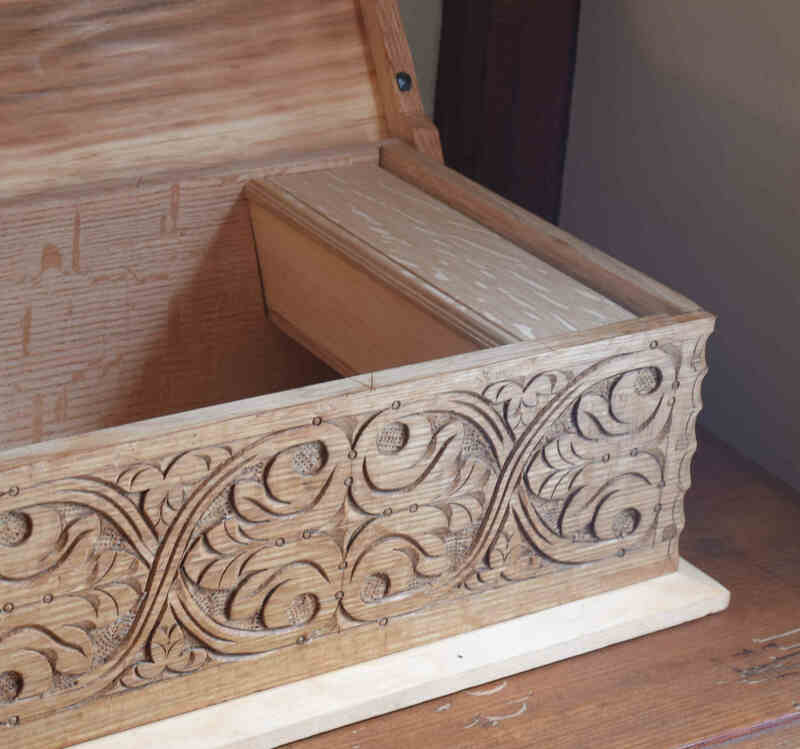 I did it in walnut once, made a terrible mess of making that box, but the carving is OK when the light hits it right. 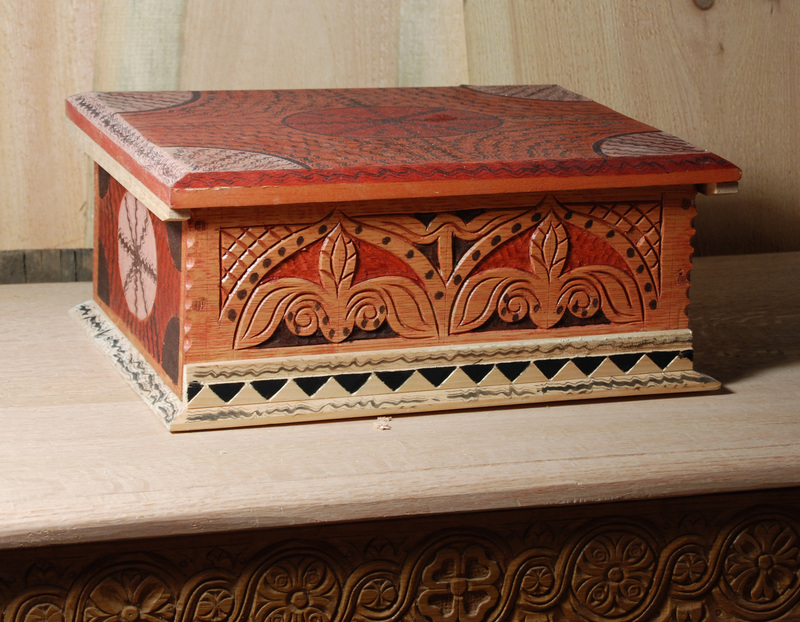 Two small boxes, one motif. These are only about 5″ high by 15″ wide or so. Same design, just aiming this way on one, the other one on the second example. Garish electric light, I don’t miss it. 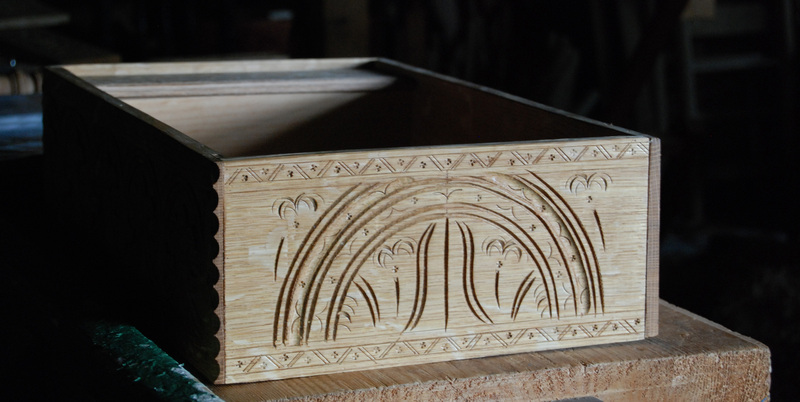 Just a raking-light shot of a box underway. A design I always like, based on an original from Braintree, Massachusetts, right next to where I grew up. 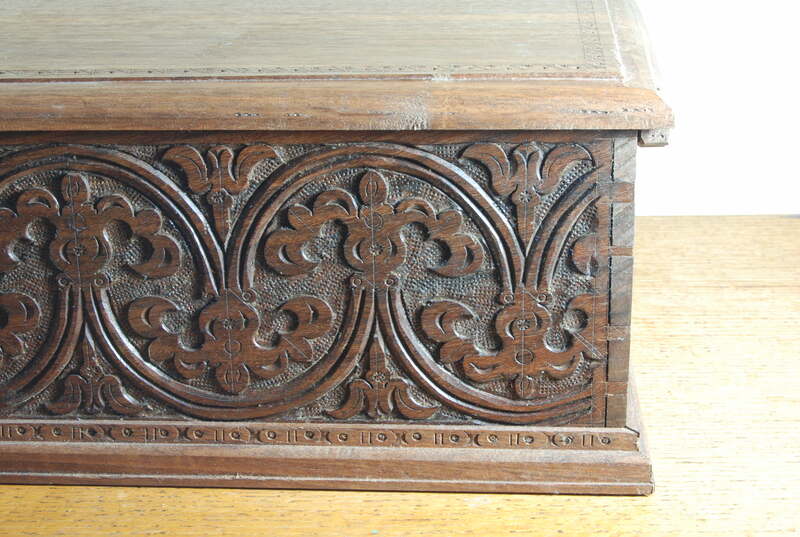 Another fairly large box; the carving is from a drawer front based on the same Braintree joinery. This box might be about 8″ high I’d guess; 20+” wide. This little one was one of my favorites; carving, molding, color and squiggles & dots. I plan on doing some carved & painted ones this spring. Here’s one before the box lid was installed, showing the till inside. 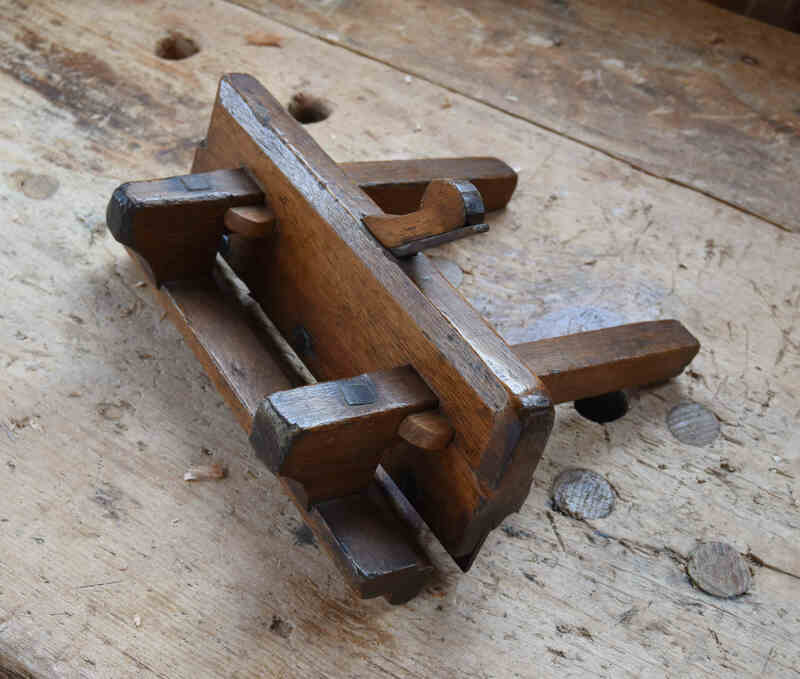 Some of these pictures have been on the blog before; here are two views of the wooden pintle hinge. 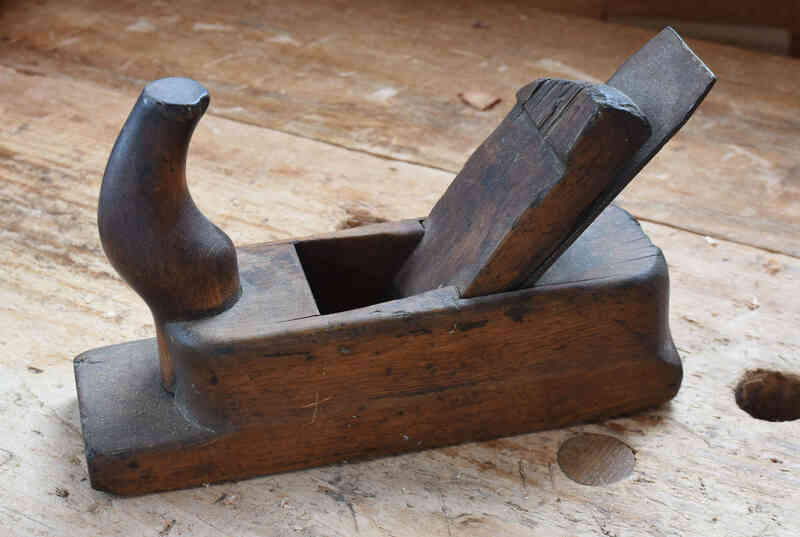 I use it most often on my boxes, although in the seventeenth century it’s the exception rather than the rule. 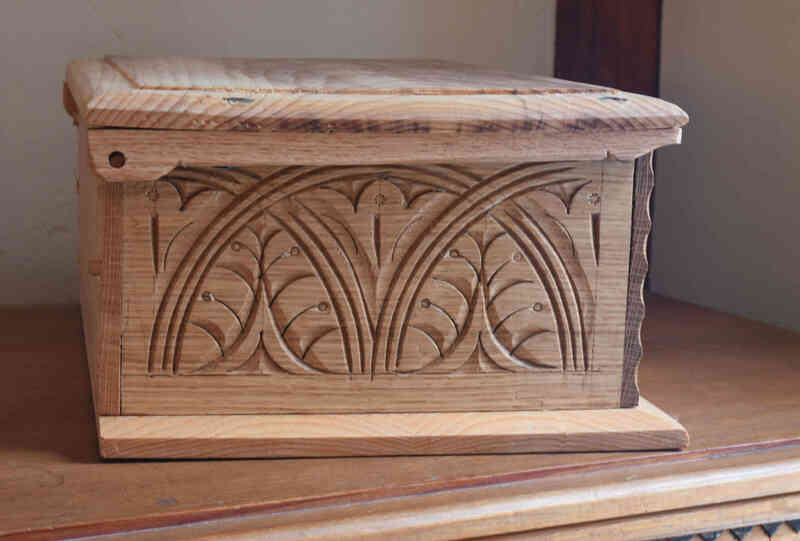 This one is from just last year or the year before, a carving sample re-used as a box. I assume that’s the inside of the front. 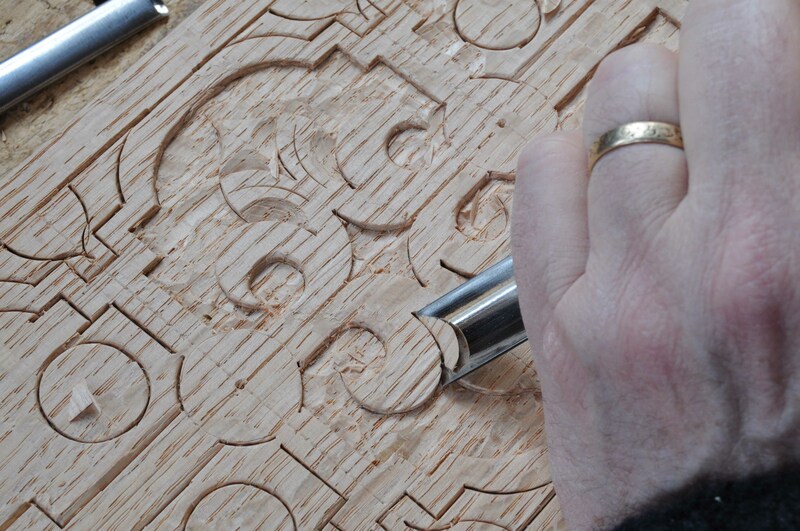 I carve the samples over & over in classes and only need them at the moment. So sometimes they get recycled. 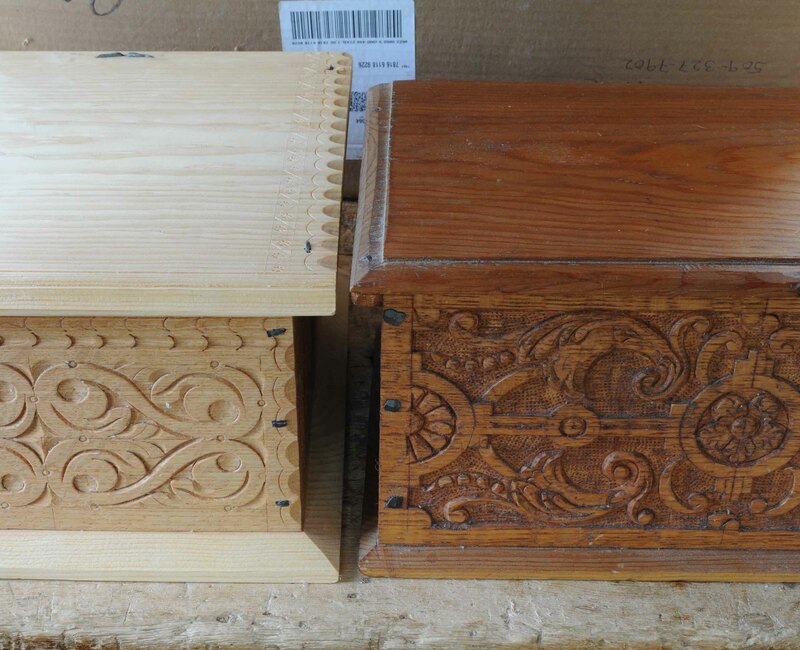 Red oak boxes with white pine bottoms and lids. Very distinct color and texture difference when new (on the left), but 10-15 years later (right) they blend quite well. Have patience. 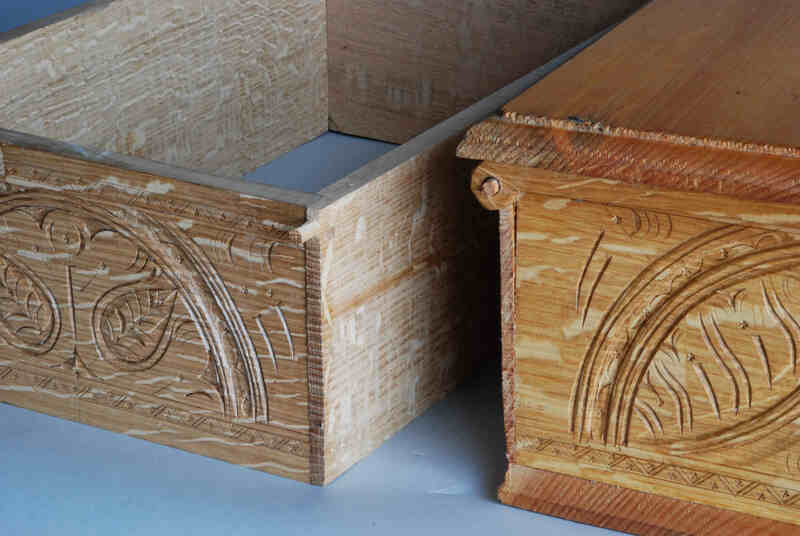 I’ve been reading through the pages of my new book “Joiner’s Work” https://lostartpress.com/collections/books/products/joiners-work recently, and was thinking about how many joined chests I have made over the past 30 years. I don’t have an exact number, but a careful guess is over 60 of them. 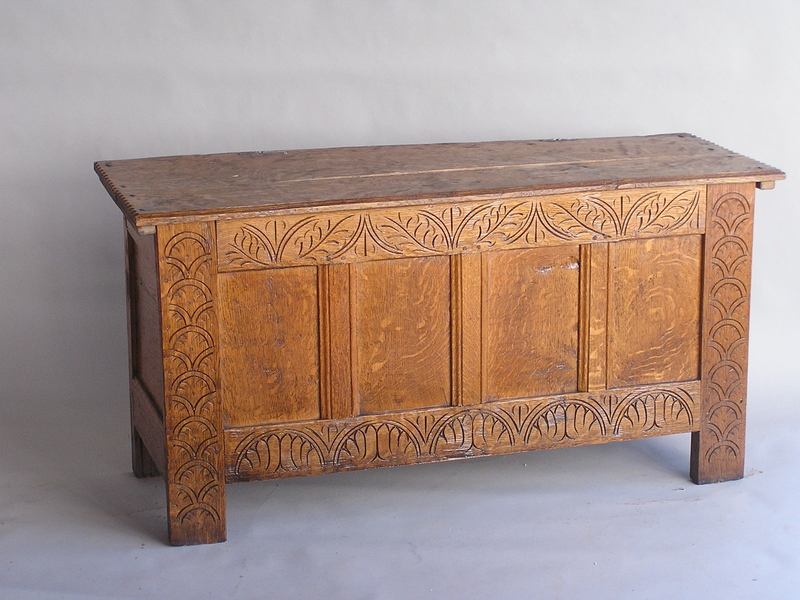 This one is loosely based on a picture in Chinnery’s book Oak Furniture: The British Tradition. 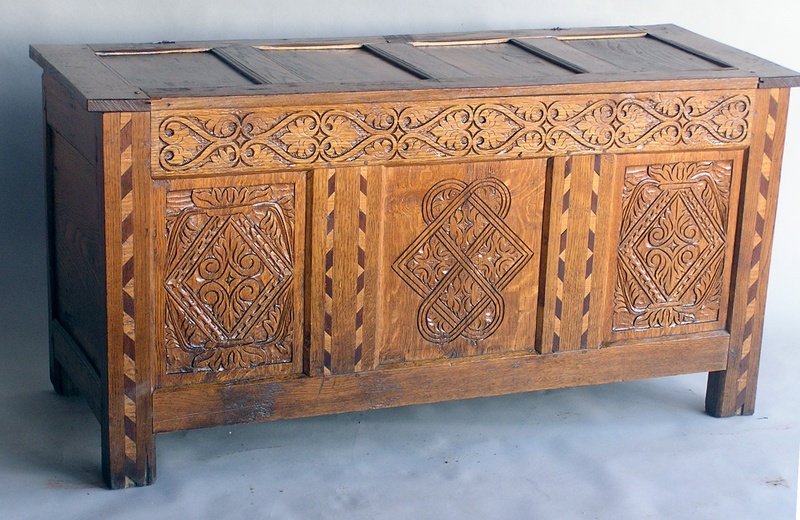 I remember when Vic and Jan Chinnery came to visit, Jan was surprised to see this chest – the original was in their house! This one is totally “made-up” in that it is not copied from any one source. I made it in 1997. All white oak. Probably pitsawn; I was younger then, we all were. Here’s part of my inlay phase! Also made-up. Also pitsawn, or mostly so. 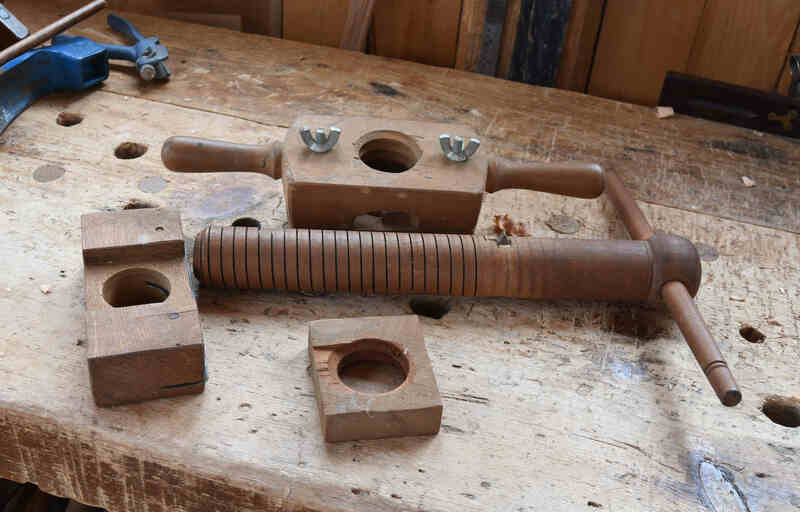 These all got used hard, and for most years got a new coat of linseed oil every year. That’s part of why they darken so. 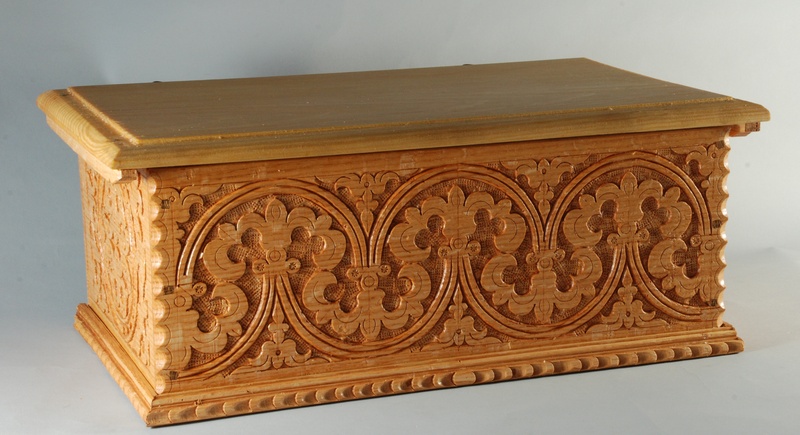 Some of the secondary wood on this one is elm, the lid panels & the end panels. Maybe the floor boards too. These photographs came about because I was forgetting which ones I had made or my co-workers made before me – so at one point I started shooting them each winter as I cleaned them and tried to catalog them. 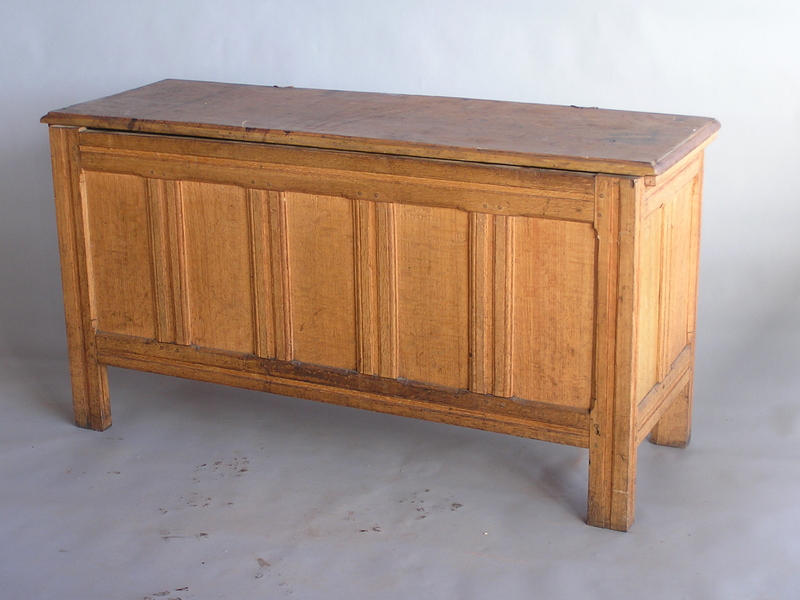 Some we shot when they were new – this one was late in my career there – I’d guess around 2004-2005, which is when I first saw chests with that wide center muntin. 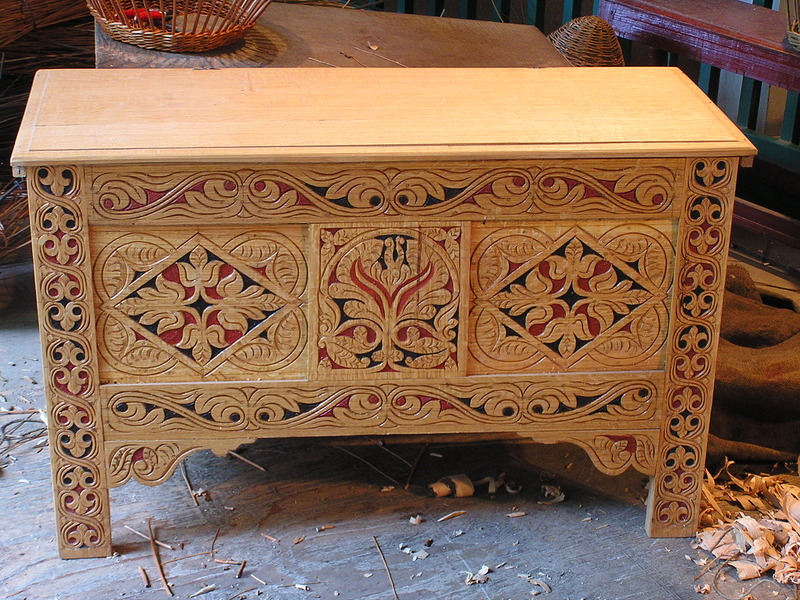 One more from that Colonial House batch – I built four houses’ worth of furniture for that project. 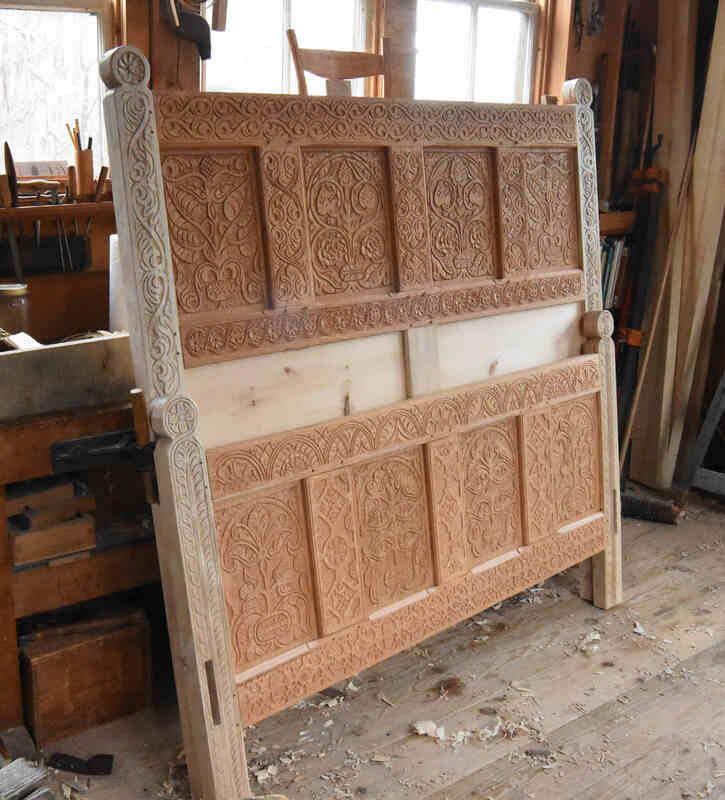 I remember later working on the motif that’s carved on this top rail & muntins – thinking I had never done it before. Clean forgot about this chest! 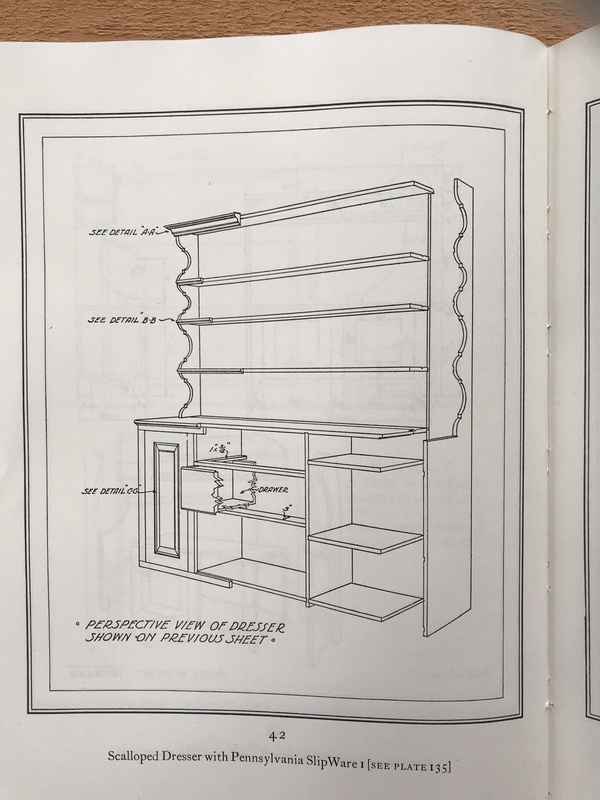 There’s no measured drawings in the book, but it shows you how to make a chest, and how to figure out the dimensions. Each one’s different, as you can see in this sampling. So glad I don’t have to move them around and clean them every winter anymore…but I’m glad I have even these basic photos. OK – one more. In process, April 2011 it says. This one’s in the book incidentally; some process shots show it underway. I posted this one on Instagram recently; making some pitiful excuses for having brought those awful plastic clamps into the shop. It’s a settle that I’m test-assembling. About 5′ x 5′. 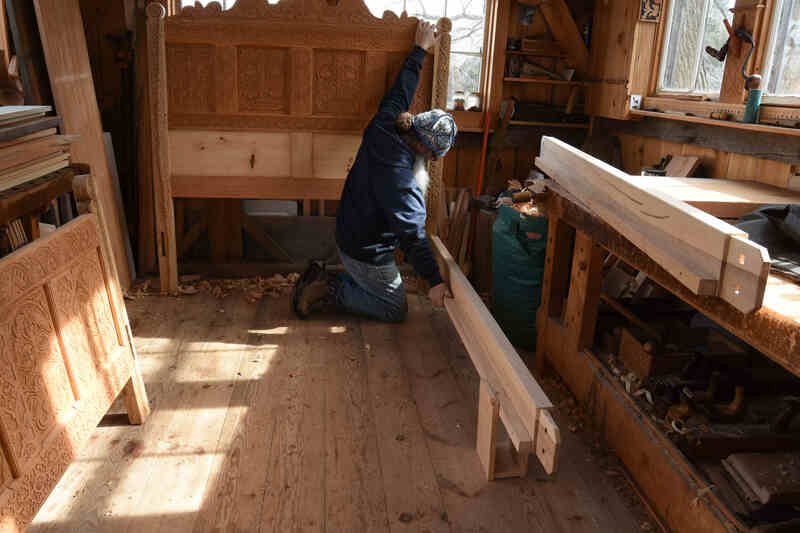 It’s for the Old House in Cutchogue, Long Island. But I can’t build it here, I have to assemble it in the house. So I copped out & bought two of those pathetic tools to help hold it as I worked out the ship=lapped boards across the back. It’s all painted now, and stacked in the corner. 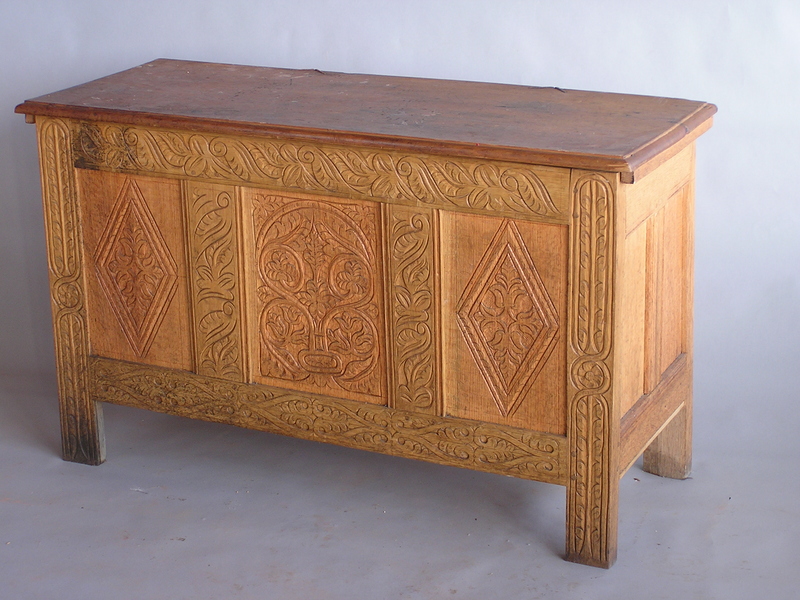 I’m onto the next thing; a large dresser for the same house. This one’s even bigger – 6′ wide, and 7′ high. Shelves above, shelves, drawers & cupboard below. 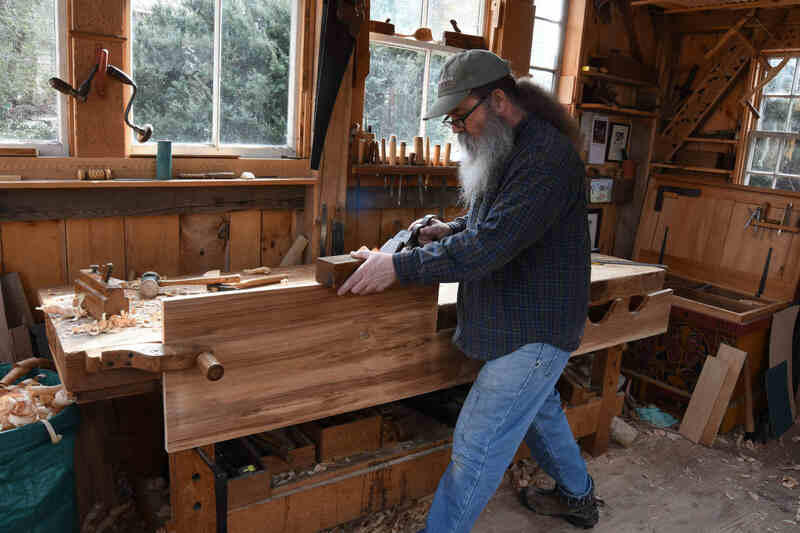 The page below is from Russel Kettell, Pine Furniture of Early New England – this is not the dresser we studied as the basis for what I’m making, but it’s not much different. 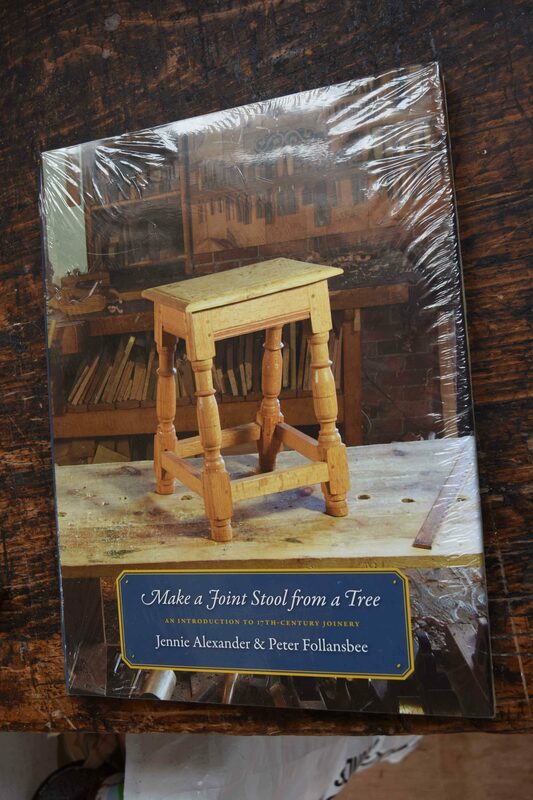 I’ve had this book almost as long as I’ve been a woodworker. It’s a wonderful book, somewhat dated now, but still excellent. You can just make out that this is a 7′ high side board to the dresser. 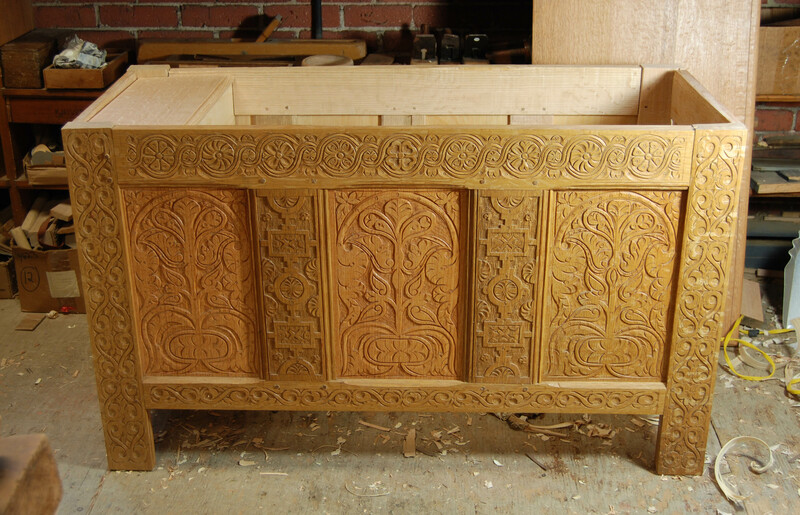 The scalloped bit just behind my back is the upper end, where the shelves for plates/dishes fit in. I’m jointing the front edge, this will be the cupboard section. 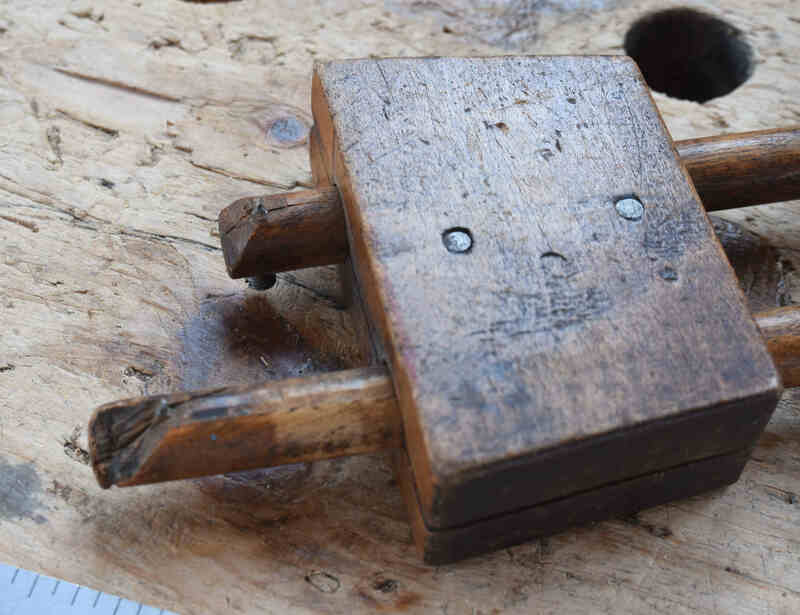 The board is held in the single screw, pinched against the bench. Resting on a holdfast in the near leg and a wooden pin in the far leg. 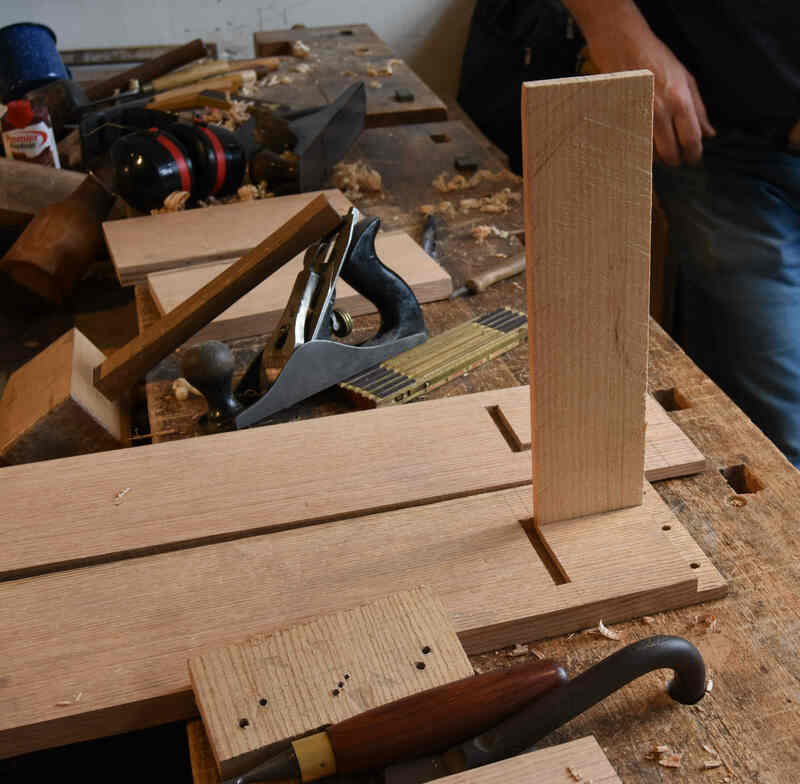 I don’t have a router plane; here I’m chopping a stopped dado for a vertical partition that is part of the cupboard. 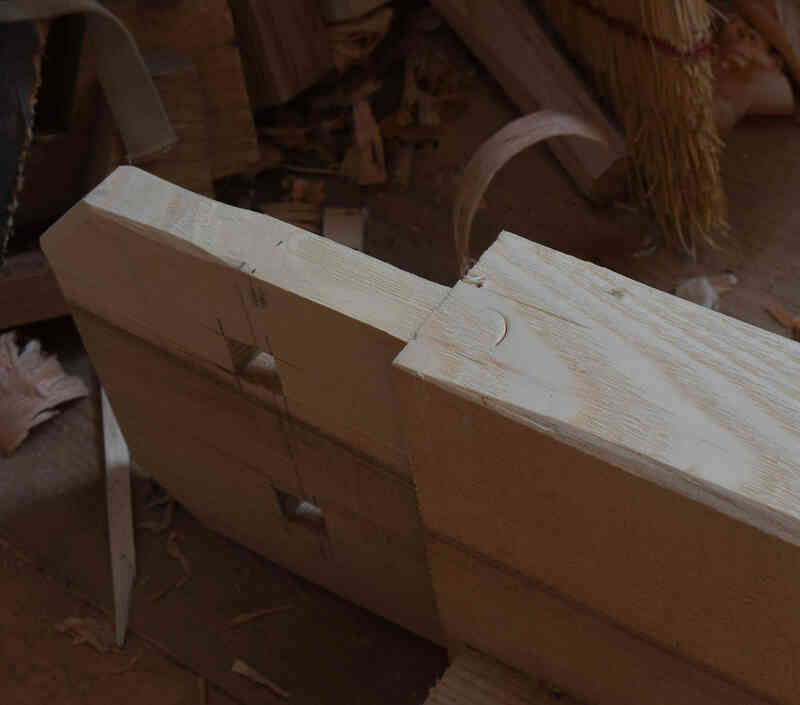 Using a chisel to chop out the waste, then cleaned up with a bevel-down chisel. Test-fitting the partition in that dado. 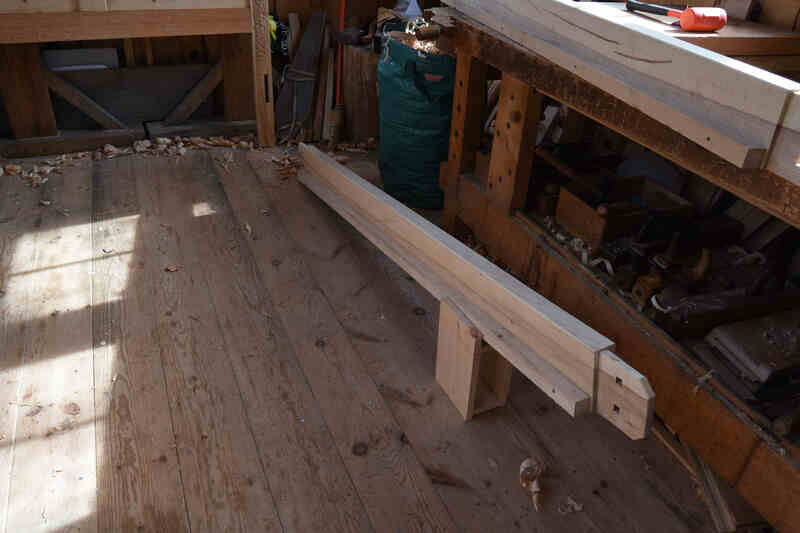 I’ve got the long shelf pinched onto the bench with 2 holdfasts and a strip of scrap pine. I shoot most of my photos with a tripod and a remote shutter-release. I forgot to hold still for this one. I’m rip-sawing a 6′ piece to make the kick-plate that fits under the lowest shelf. I’m not sure I’ve ever pointed it out, but I keep a large open bag at the end of the bench. It doesn’t catch all the plane shavings, but it catches a bag-full. 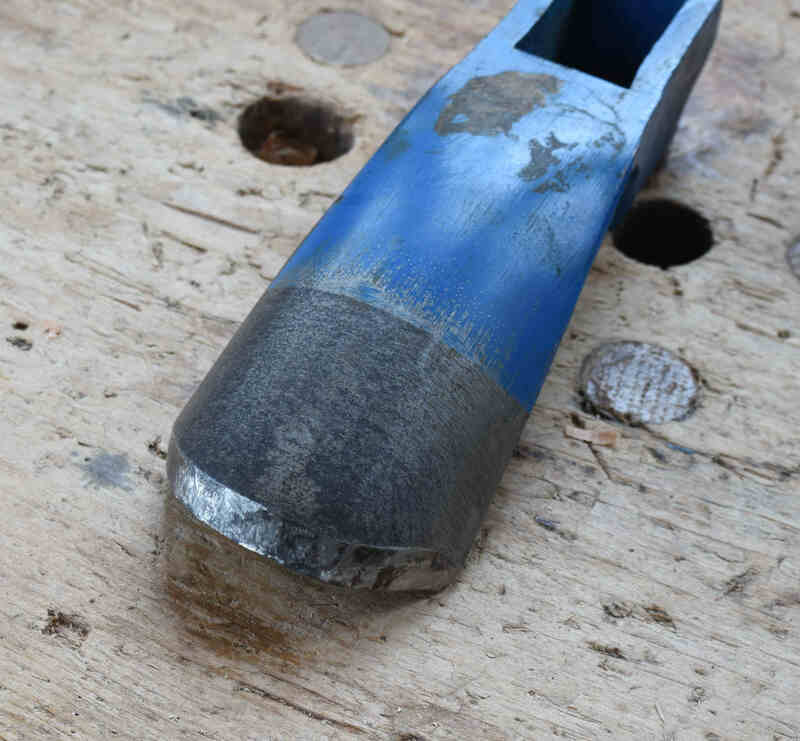 I’ve started jointing the kick-plate and here I’m checking with one of the most accurate tools in our arsenals – eyeballs. I don’t work from drawings. I do best when I get the piece started, then I can easily see where to go next. This is my end-of-the-day, “what was I thinking?” look. 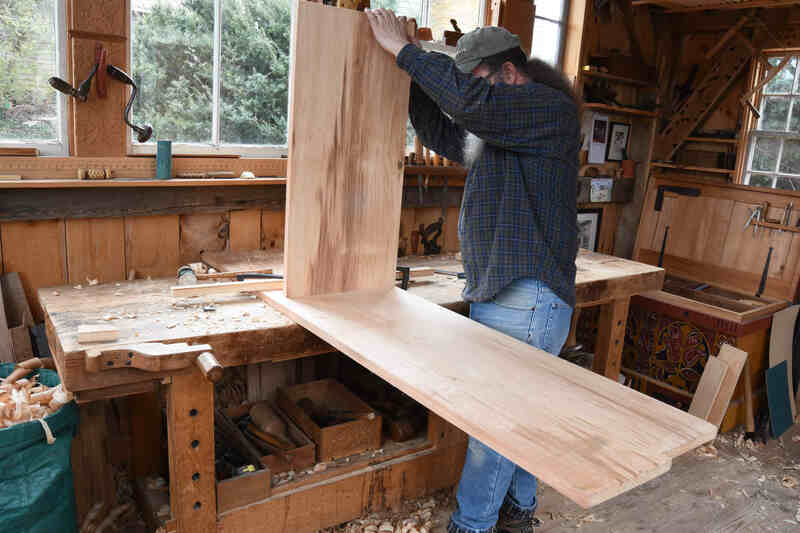 I’ve got one upright, the vertical partition and the mid-shelf mocked up across from my bench, and I’m trying to figure out the next piece to cut. 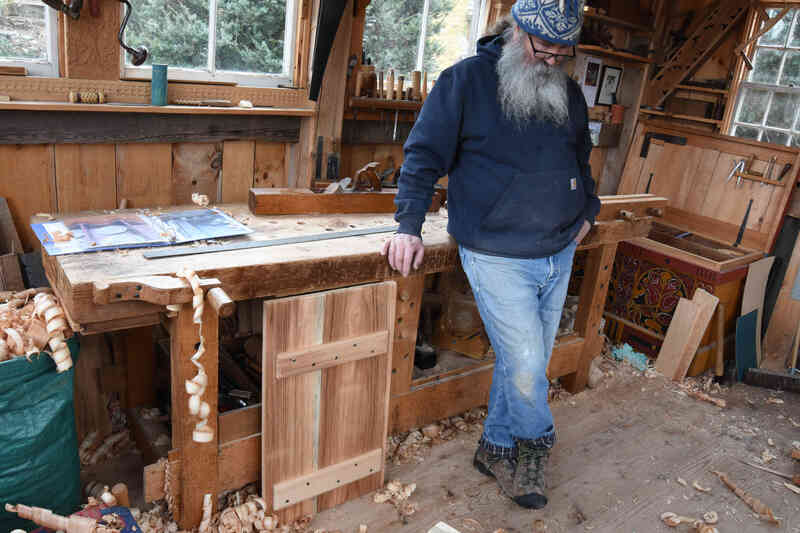 The cupboard door is standing beside the bench. This picture is here because the camera was set to shoot every-so-many minutes. Building big stuff in this small shop, and setting up a tripod makes it tricky sometimes…so I just stuck it in the corner and got lots of photos to delete. some tools for sale, plus a box, basket, etc. 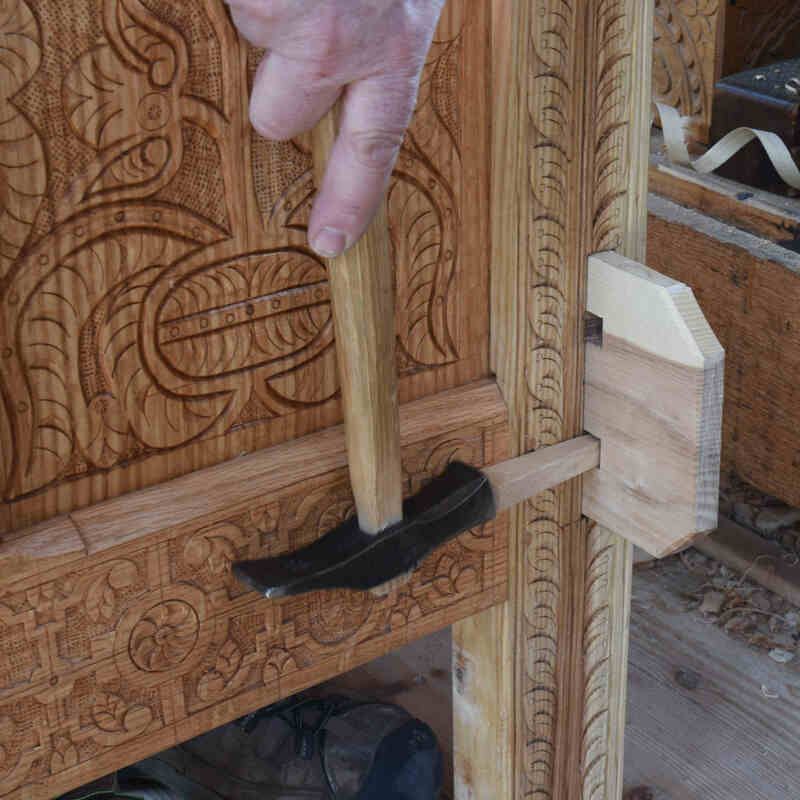 Recently I posted a photo or two about the un-thrilling task of cleaning up the shop. This past week I made it into the loft to begin a clean-out up there. There’s things there that were in my old shop at the museum; nearly five years ago. 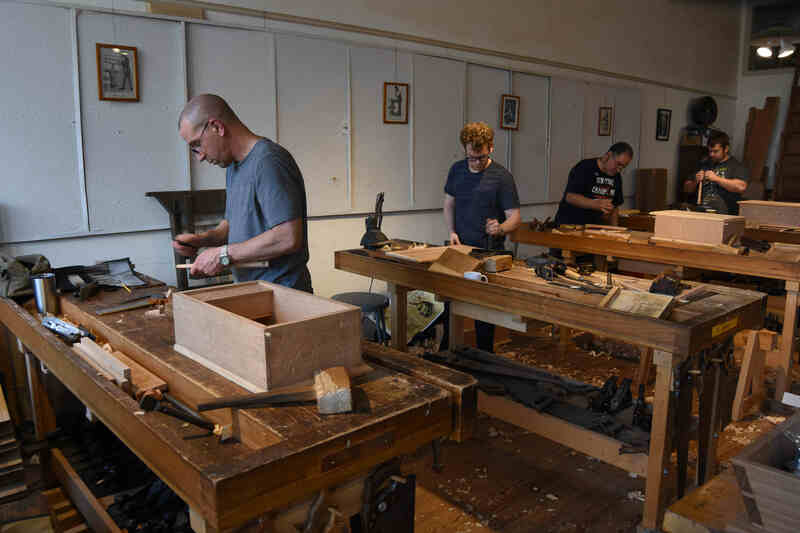 They were extra tools then, got stored after that, then when I built the shop, they came out of storage only to be….stored in the loft. 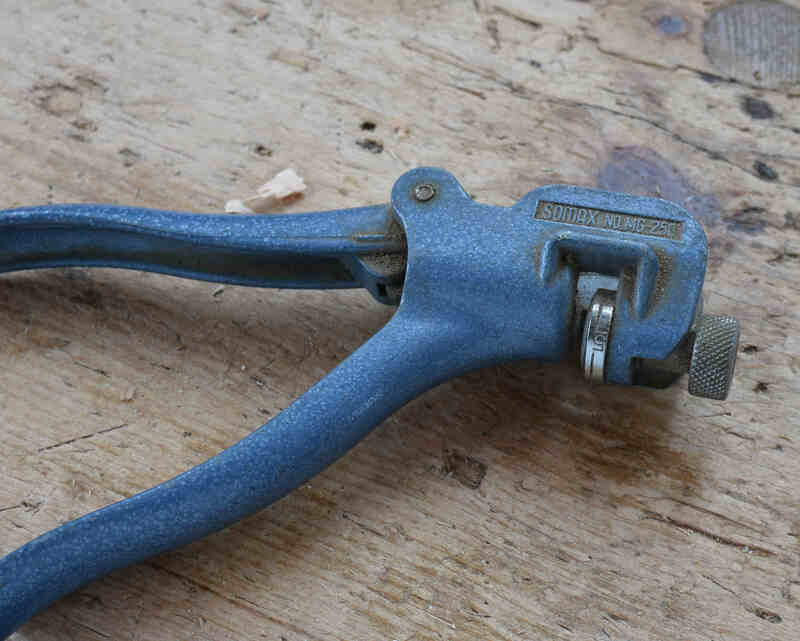 Time to sell off some tools, nothing fabulous, but some planes and a few other bits. If you want any of these items; leave a comment on this post, citing which item you are interested in. Timed comments help sort out any tussles. I’ll send a paypal invoice afterwards. Prices include shipping in the US. 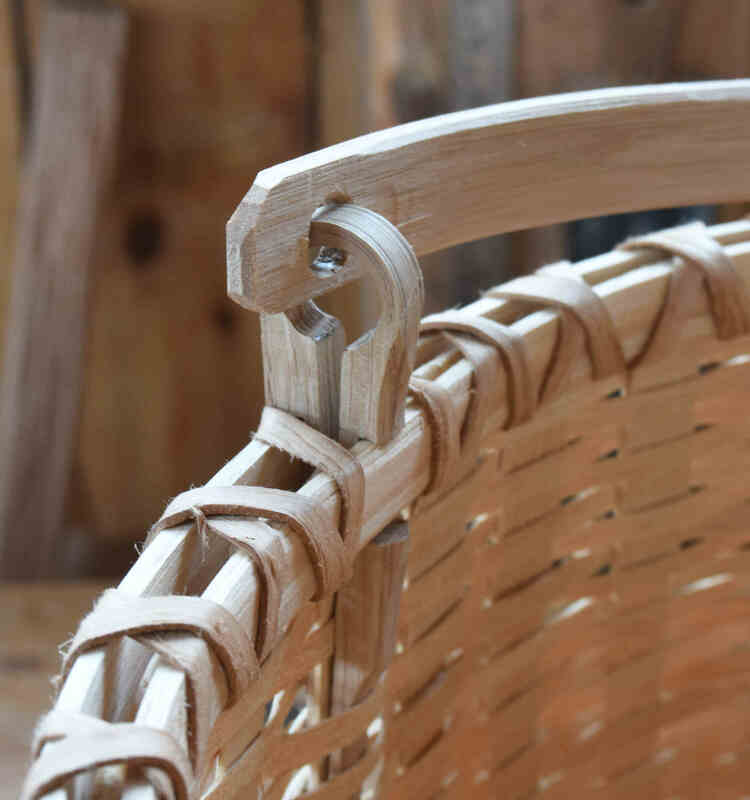 There’s also a couple of recently-made items; or recently finished. 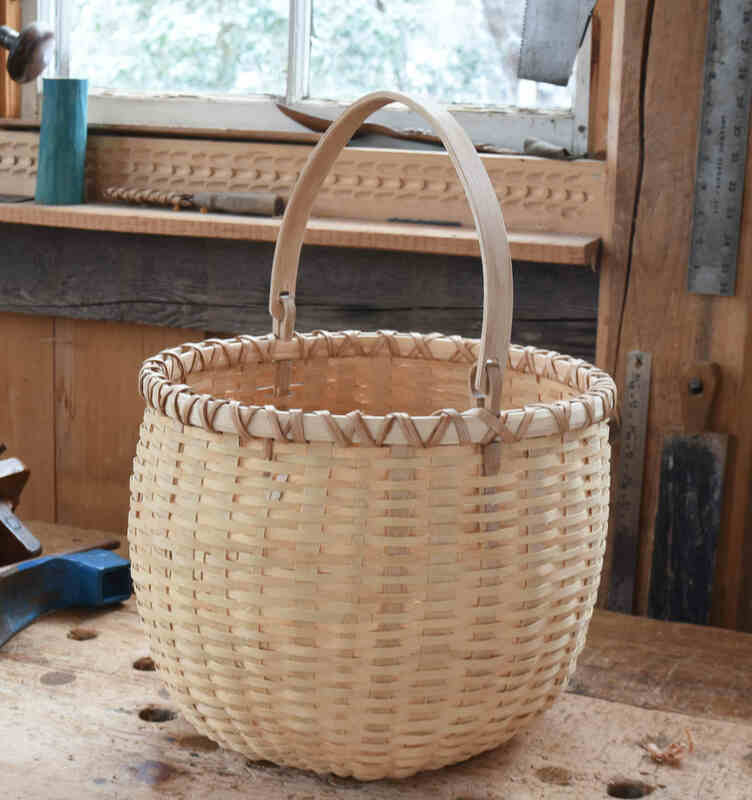 A box, a basket, and a knife handle & sheath. Here’s the details. This is the year of the box. 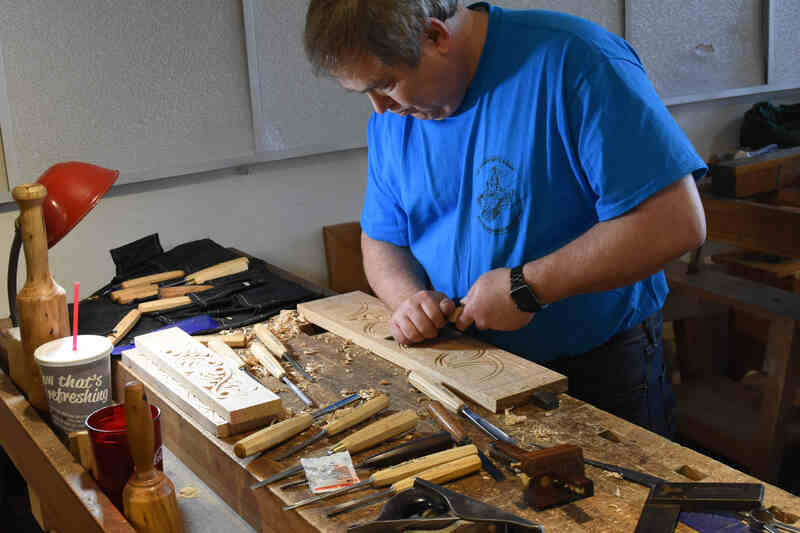 I’m teaching it several times, twice at Lost Art Press https://www.eventbrite.com/o/woodworking-classes-at-the-lost-art-press-storefront-11163310977 . Meanwhile, here’s a recent one I just finished. 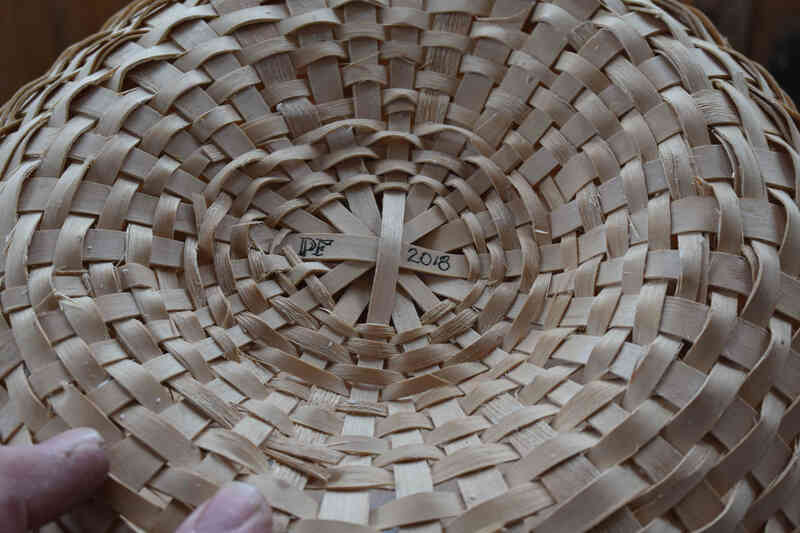 The white pine lid is streaked with darker brown bits, but over time the whole thing will take on a patina that blends these differences together. Till inside, wooden hinges. 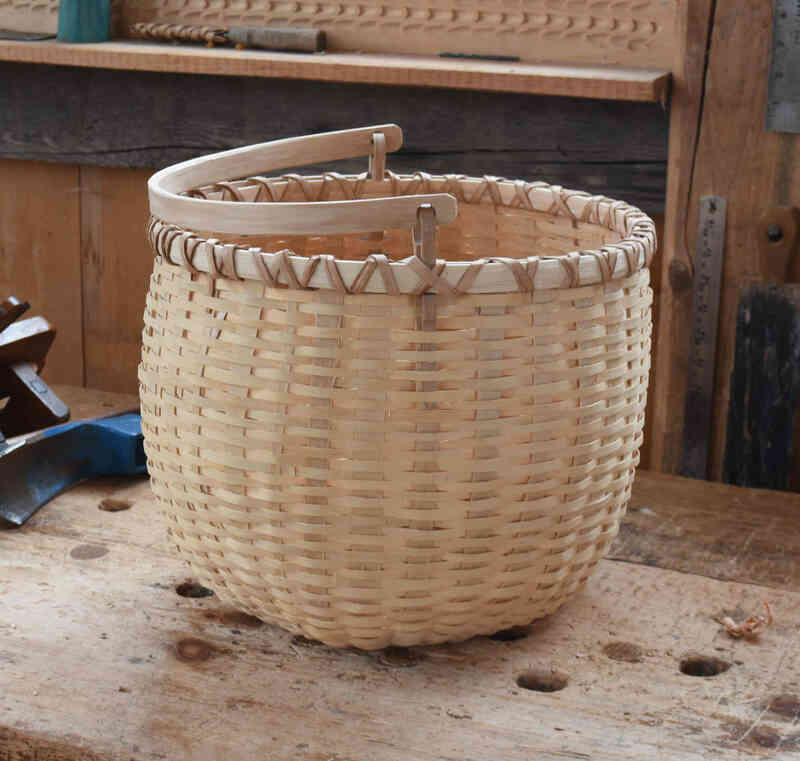 Made the basket last year, finished the rims and handle with some hickory and white oak last week. 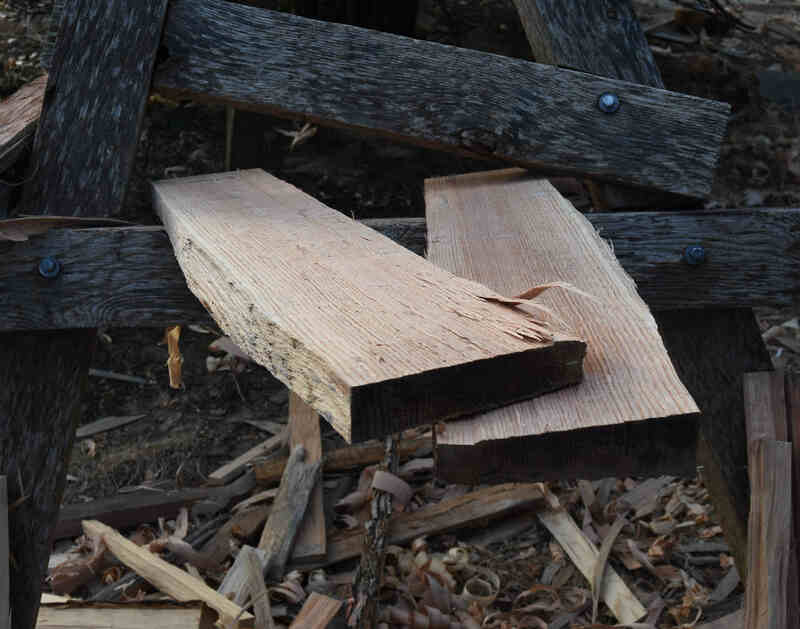 Hickory bark lashing. If there’s no takers, I’ll fill it with oak pegs and hang it from the rafters. Like the others. I half-made this, it’s a Morakniv 106 blade. 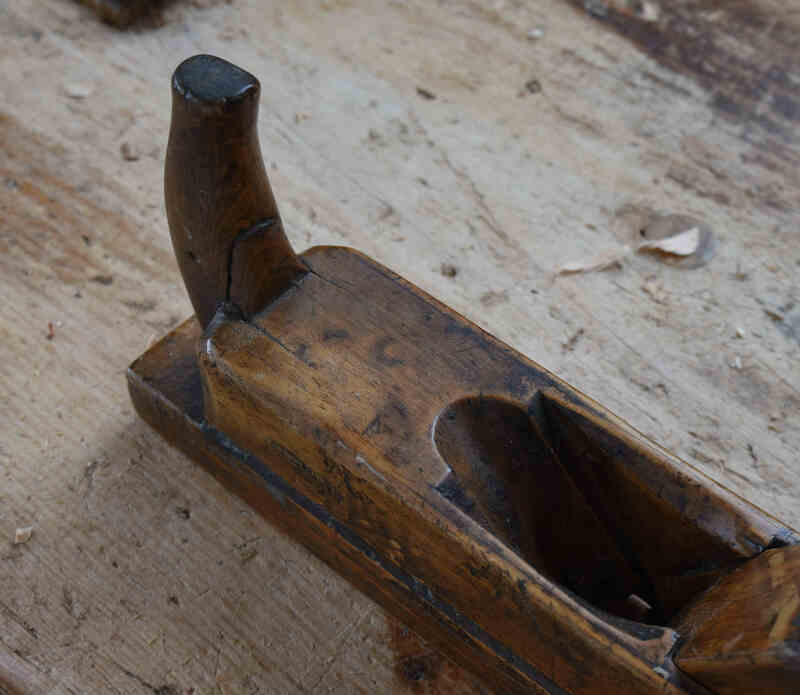 to which I fitted a butternut handle, carved. 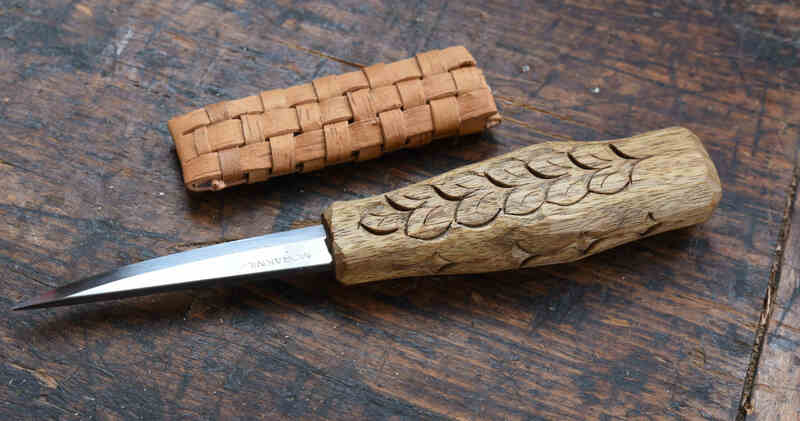 Birch sheath. Had a custom order for one, made two while I was at it. Found two shrink-wrapped copies of this one. 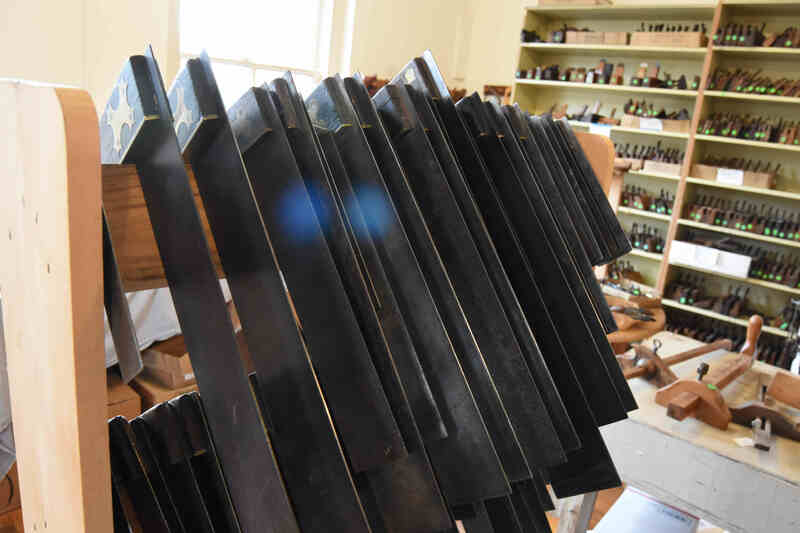 First, some horn planes. These came out of a box that is mentally marked “extra planes.” There’s still 7 or 8 planes in that box, so these were extra-extras. 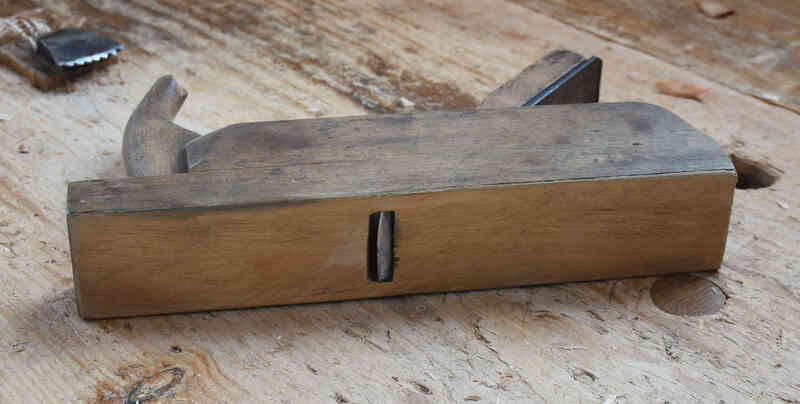 Horn Plane #1; SOLD German, ECE. 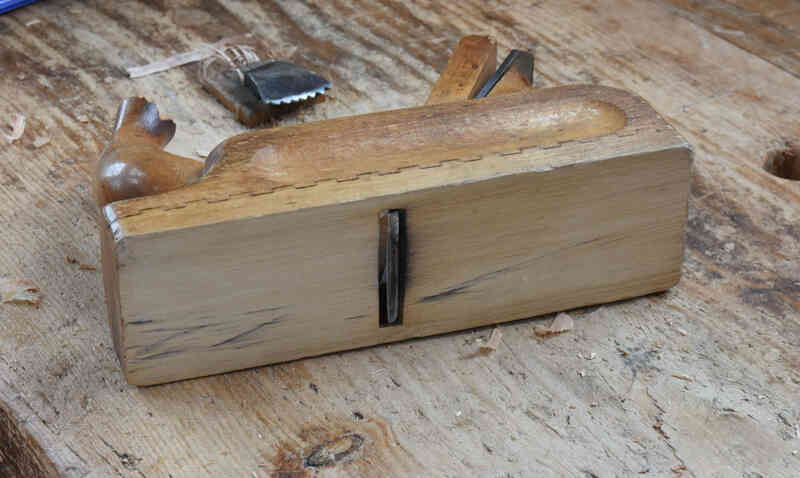 I converted it to a scrub/fore plane. Convex iron…I used it for a long time. It’s still in fine shape. Will need some cleaning, and sharpening. This one’s missing its medallion, I don’t know the maker. It’s heavier than the ECE one above, a little longer. Its iron need grinding as well as honing. I guess I never re-habbed this one. It’s a nice plane. This one is a little more worn than the others. 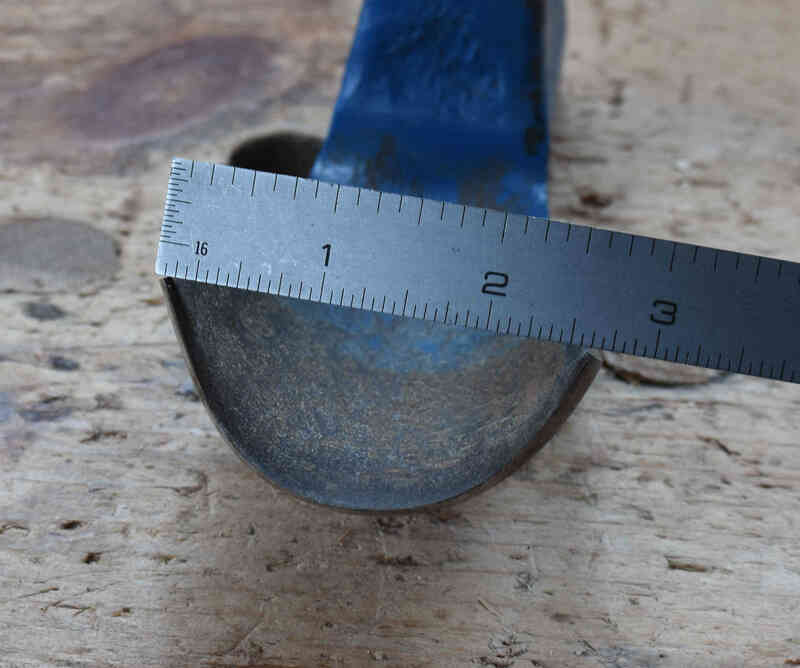 Wedge is chipped at its top end; and the mouth is really wide. It could stand a patch let in to close the mouth. 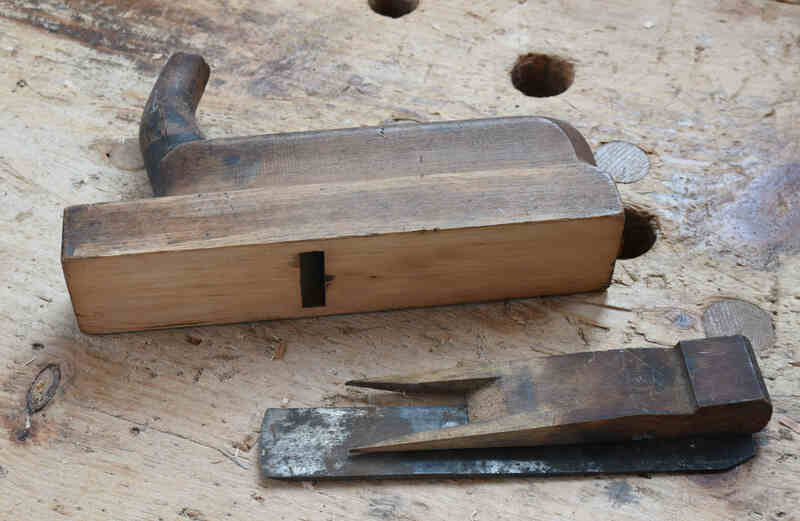 Or re-grind it to be a generous scrub plane. 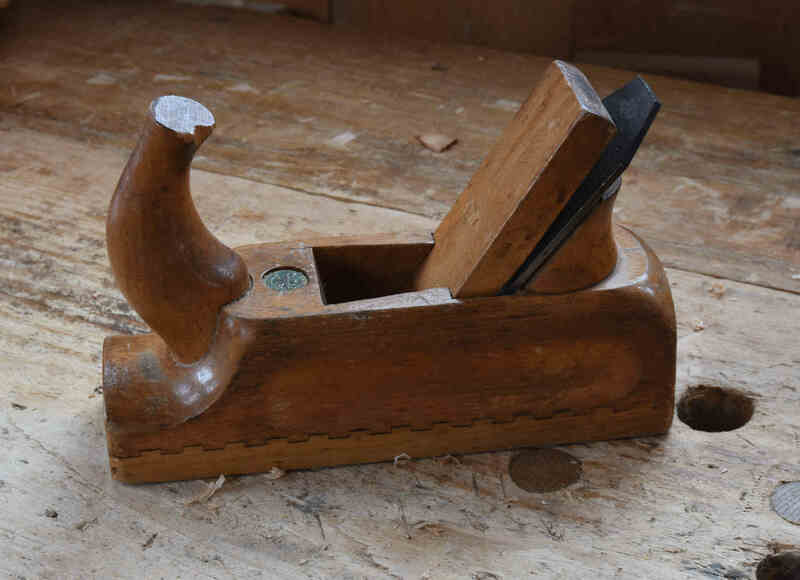 I had students use it as is, it makes shavings. Just dangerous if you get your finger in there. 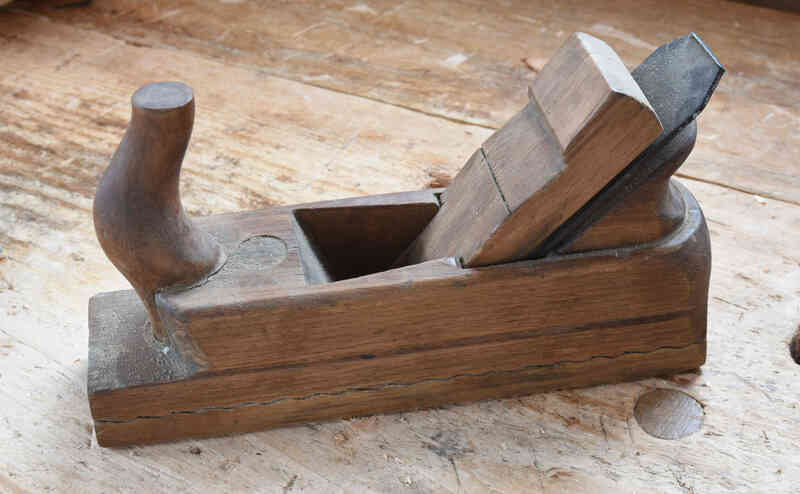 A nice little scrub plane. Clearly a replaced iron from somewhere. Someone told me this plane is French, but I can’t swear to that. It’s not beech. 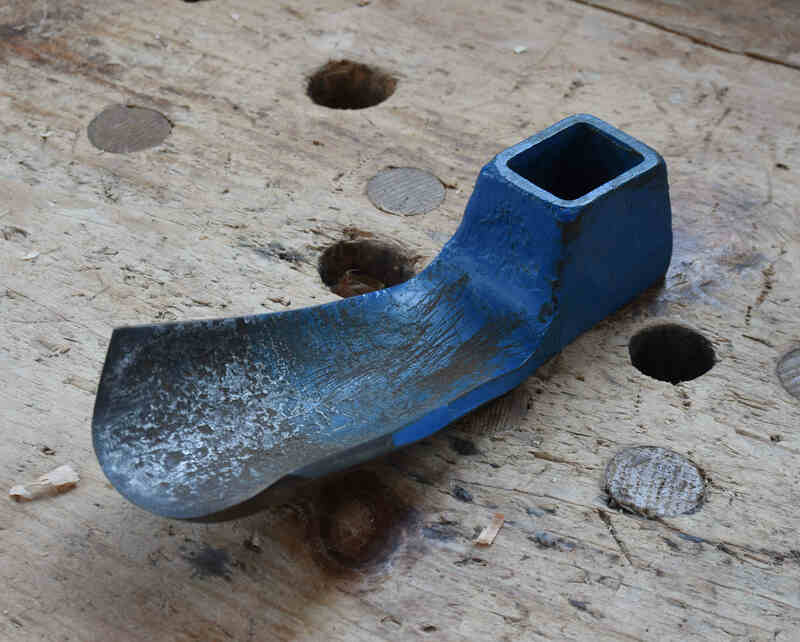 Nice patina, some wear here & there, the horn has a glued-together crack. Another unknown. Not sure I ever worked with this one, either. It’s got a nice hollow-grind on it, but not sharpened. Iron needs some clean-up. 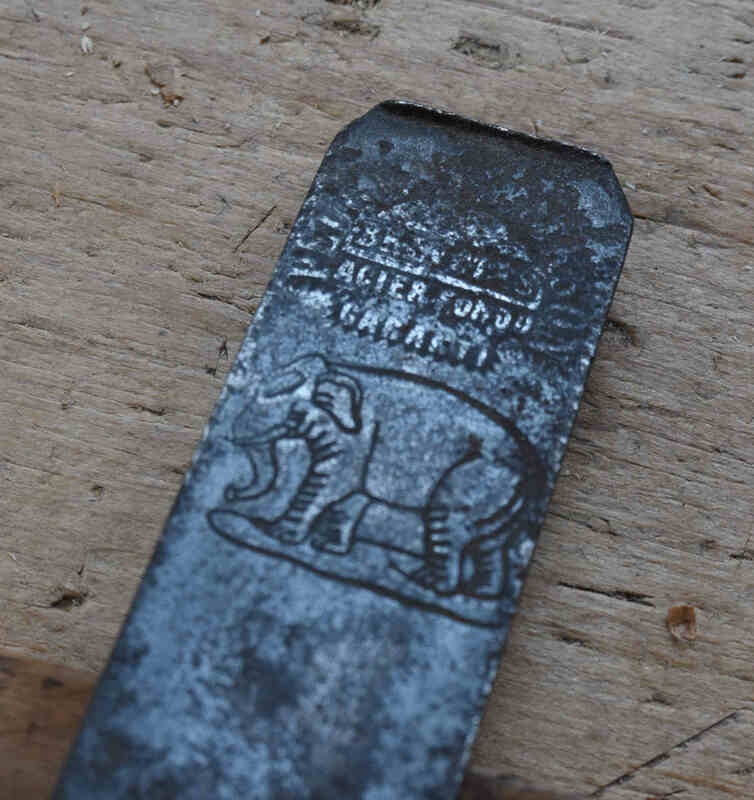 Great Elephant insignia on the iron. Chip on the tip of the horn. It’s a theme. I guess I bought these whenever I saw them. Some came from Alexander too. This one needs cleaning & tune-up, but is in fine shape really. Its iron will clean up with some elbow-grease. I got this plane from Ed Lebetkin. It’s a simple one, in fine shape. I used it some with students, but it’s been stored so long it’s time to move it on. 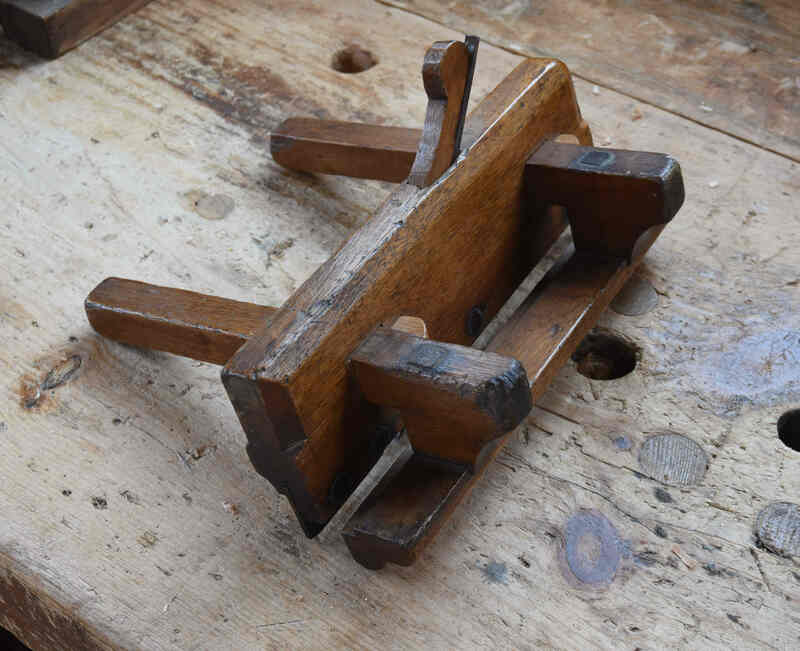 I used to use this one for roughing out Windsor chair seats. 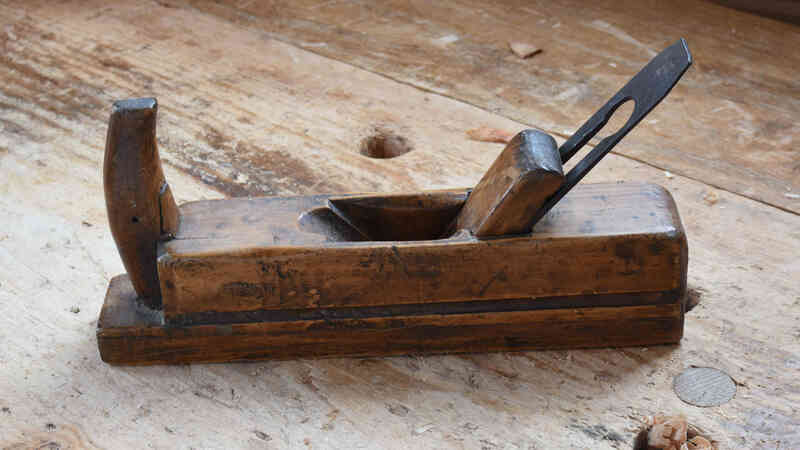 Later I got a Hans Karlsson adze for bowl-carving – this one got shelved. A little too big for bowls probably. Except for really large bowls. 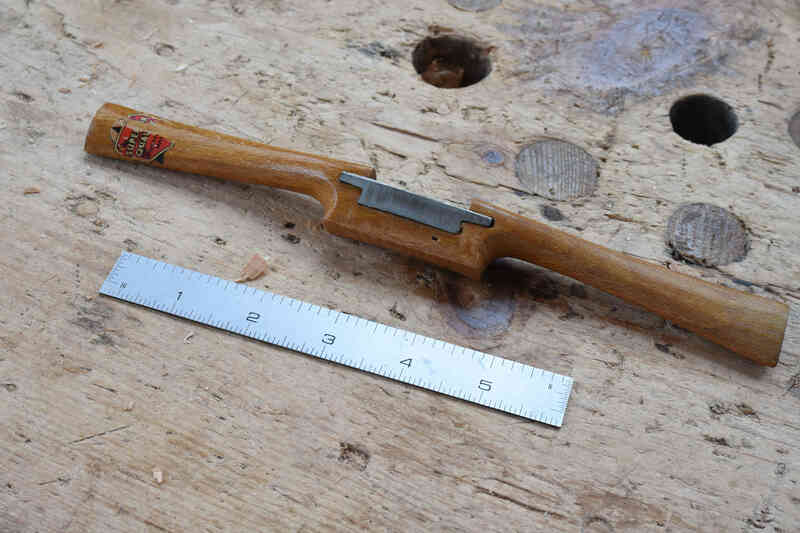 Austrian, I bought it in the mid-1980s; sawed a poll off the back end. I forget if it had an exterior bevel when I got it, but it does now. 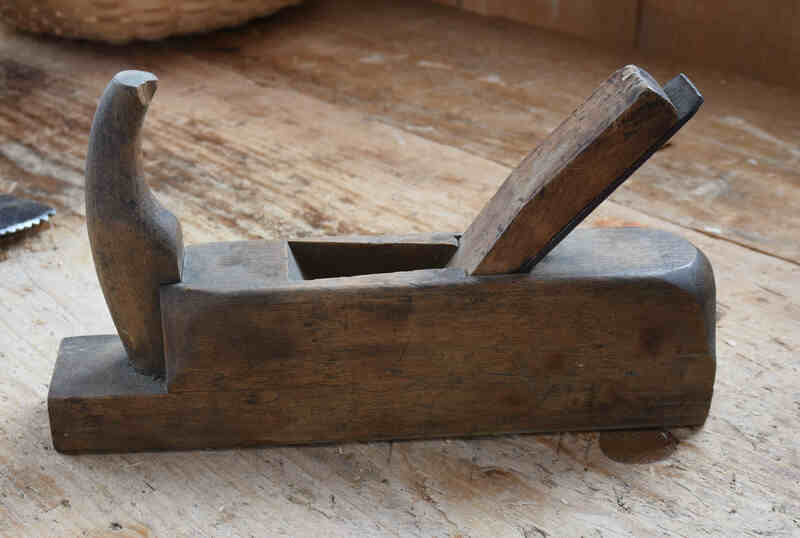 Needs sharpening and a handle. I had this one for many years, rarely used. I bought a vintage one several years ago, and I sure don’t need two. So it sat for a long time. This one has a story. It was Jennie Alexander’s…she & I argued about it for years. She never used it, but loved it in theory. I have other favorites. 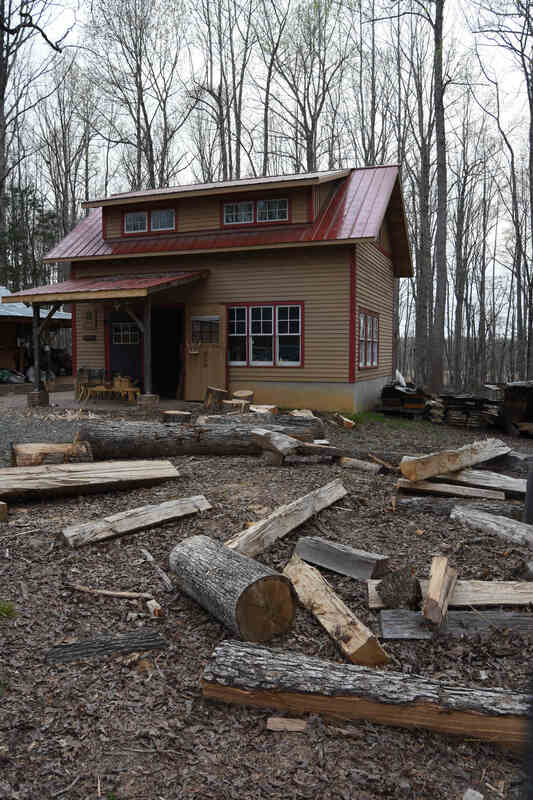 When we cleaned up JA’s shop, I took it because of the story. I still have the story, but don’t need the tool. 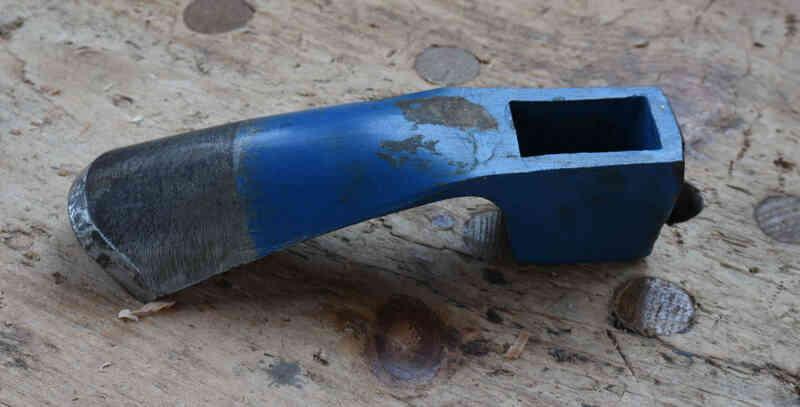 Spokeshave #2 bottom one 9 1/2″ iron 1 3/8″; body more slender than above. price? I don’t know…. first offer is $60. Next one’s at $100. Another JA tool, with another story. This one I’ve had for several years, after JA insisted that I had arranged for someone to borrow it from her. I never remember being involved in any way with the loan of a large threader, but JA would not hear of it. Was sure that I somehow arranged it. 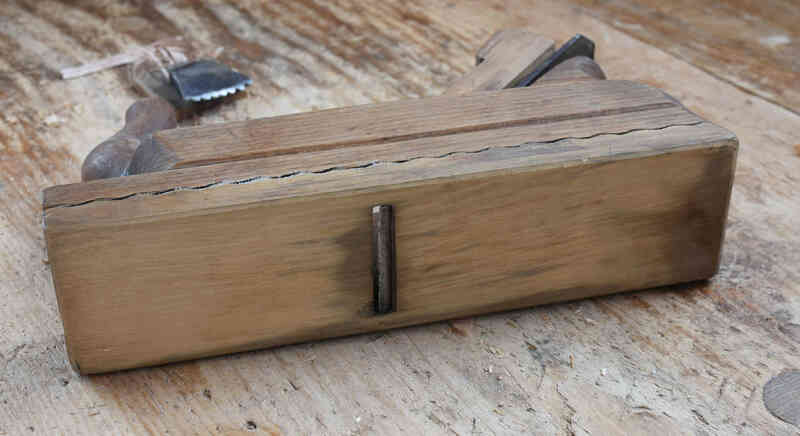 Eventually, someone returned to me this large home-made tap & die. JA claimed, nope – that’s not the one. So for the past 8 years or more, I’ve had this in a box. I have no idea of its value. So make me an offer. I’m not aiming to get rich off this tool. Off any of these come to think of it. 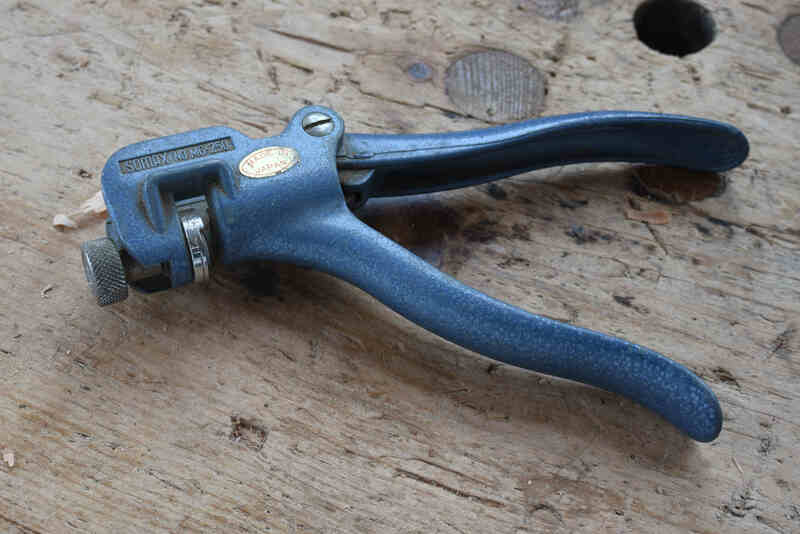 If more than one of you wants this tap & die, we’ll go with the best offer by Wednesday Noon, Eastern gets it. I keep the story, as always, the important part for me. various sizes & shapes. The bottom four are Robert Sorby. 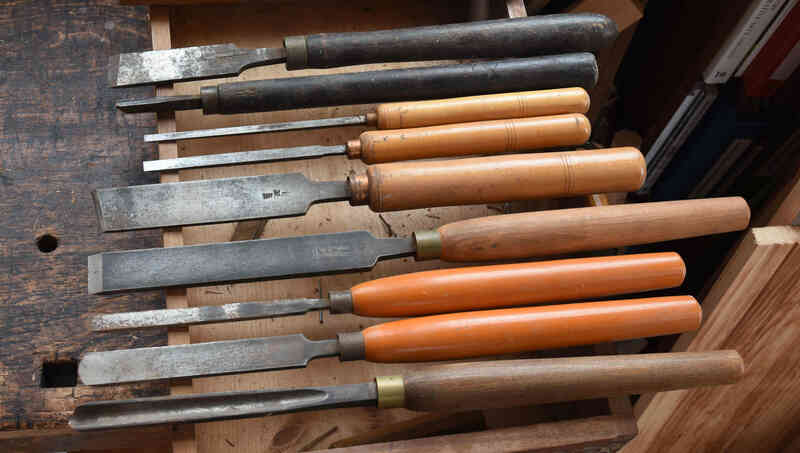 c. 1980s; some scrapers, a bowl gouge that needs re-grinding; and a large straight double-bevel chisel. 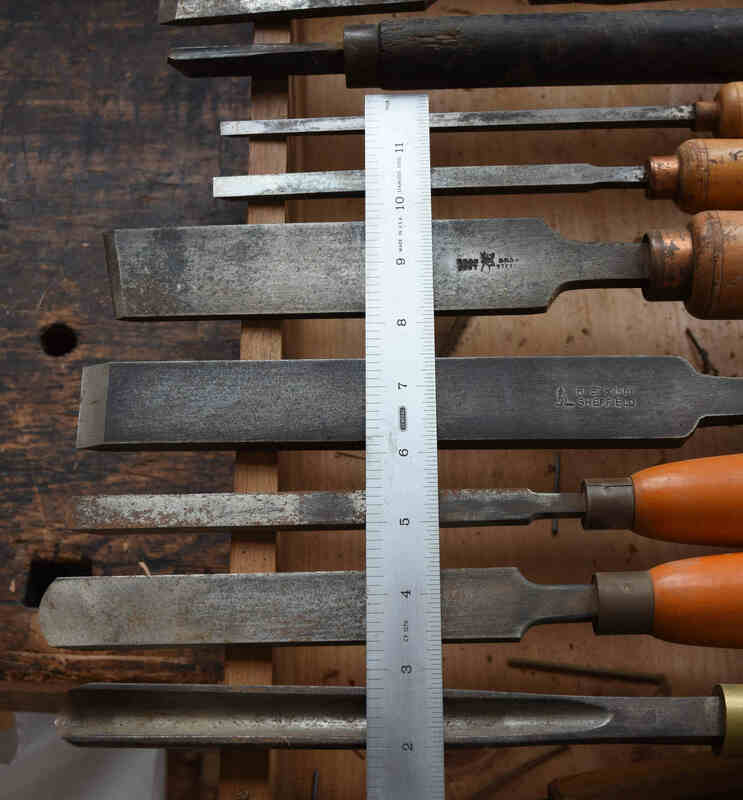 There’s 3 Buck Bros tools, a large skew, and two narrow straight tools, single bevels. 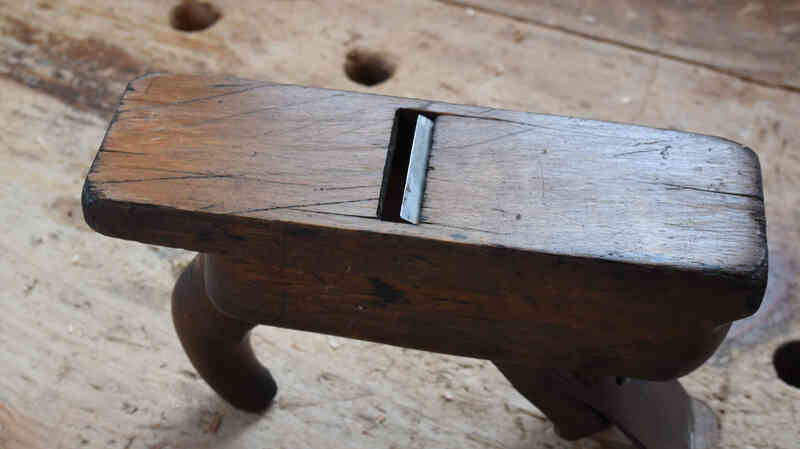 Then 2 antiques; a small gouge, and a large skew? 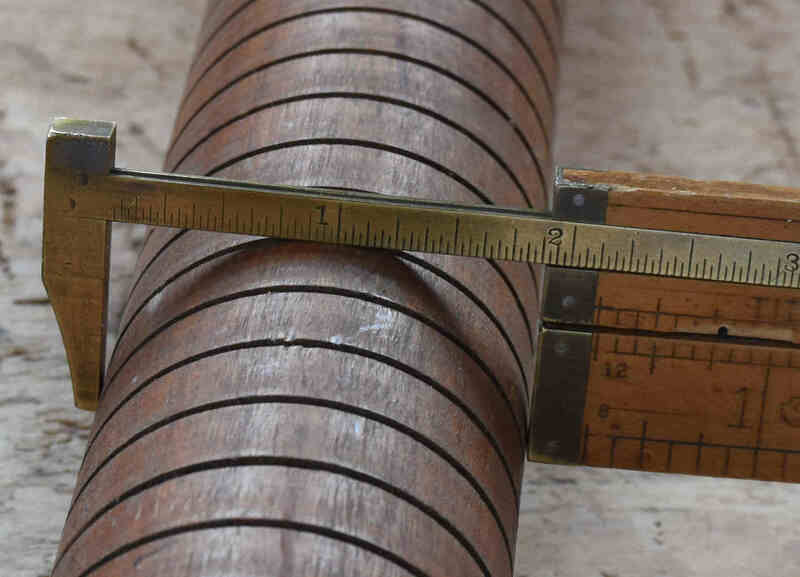 Lengths range from 14 1/2″ to 21″. 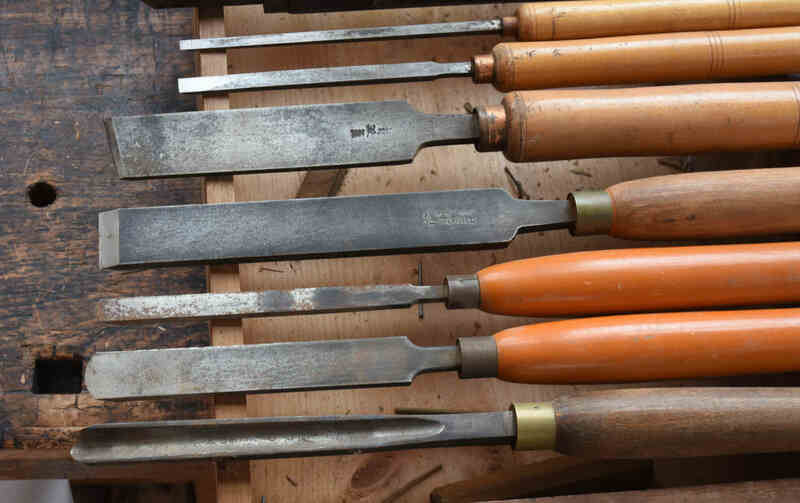 These tools were neglected, but can be revived. I have too many turning tools, and I only use about 5 of them. I’d prefer to sell these as a pile rather than one-by-one. It’ll be a heavy box. How’s $125 shipped in US? 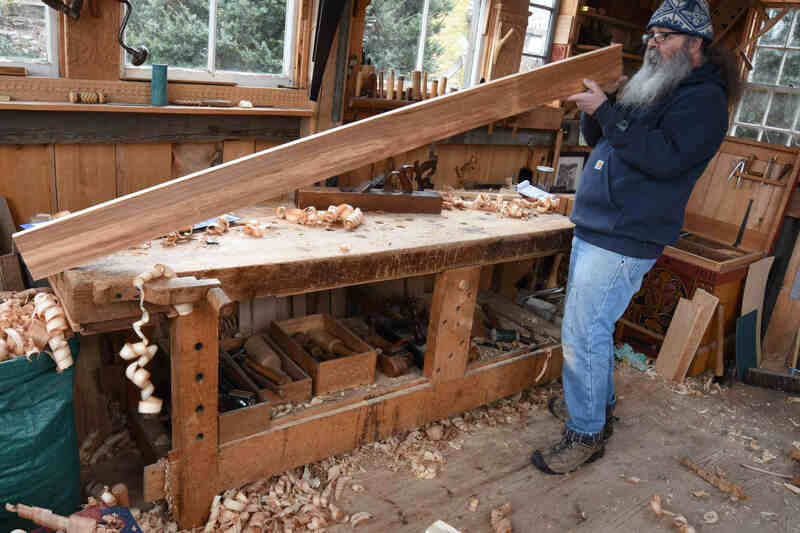 An extra-long rabbet plane. Someone once said had to do with shipwright’s work, but again, I don’t know that. I only know joiner’s work. Can’t imagine it’s worn away so much to open the mouth that much. Could use a patch or new sole added. 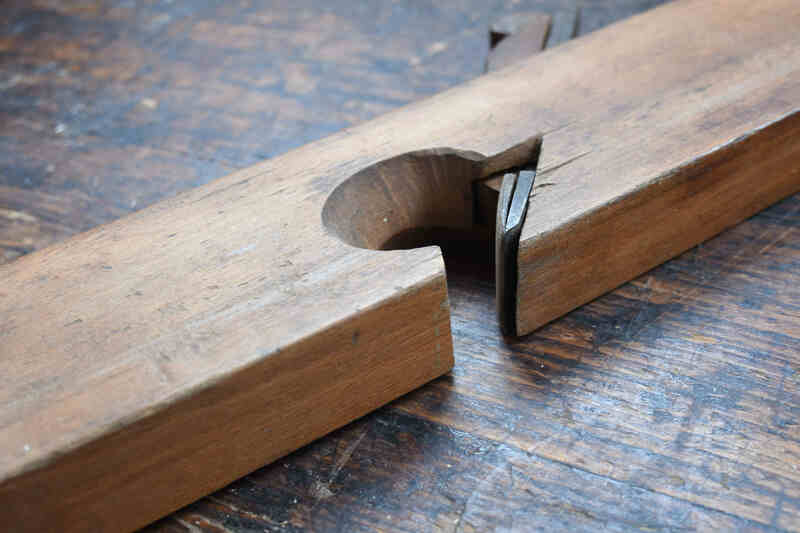 Nice iron/chipbreaker arrangement. I’ve been building this bedstead for an embarrassingly long time. 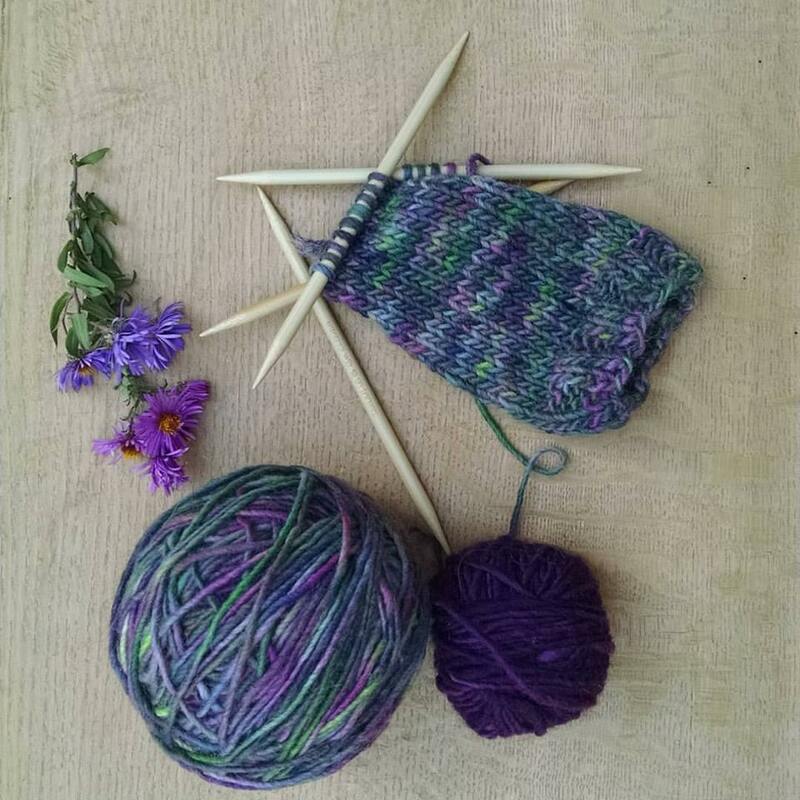 My ever-patient customer will assemble at her house in the southwestern US. So I have compiled a how-to for that work. Some of you might like to see it also, so I made it a blog post. First off, this is NOT a period-correct bedstead. It uses construction that is perfectly within 17th-century range, (except the slats under the bedding) but I’ve not seen it on a bedstead. 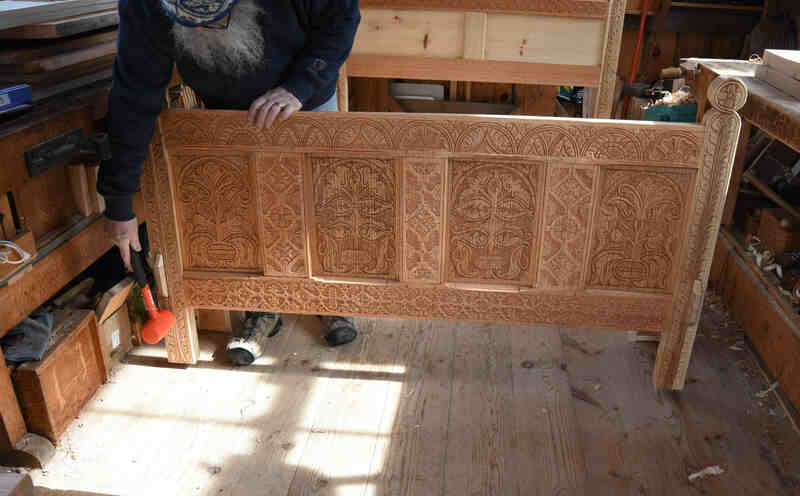 One of the hardest parts of my old job was “what was the bed like?” – there are no New England bedsteads that can be attributed to the 17th century. So I made this one up – with the idea being that it could easily be shipped across the country. And assembled without any particular skills. Our bed at home is done in a similar manner. 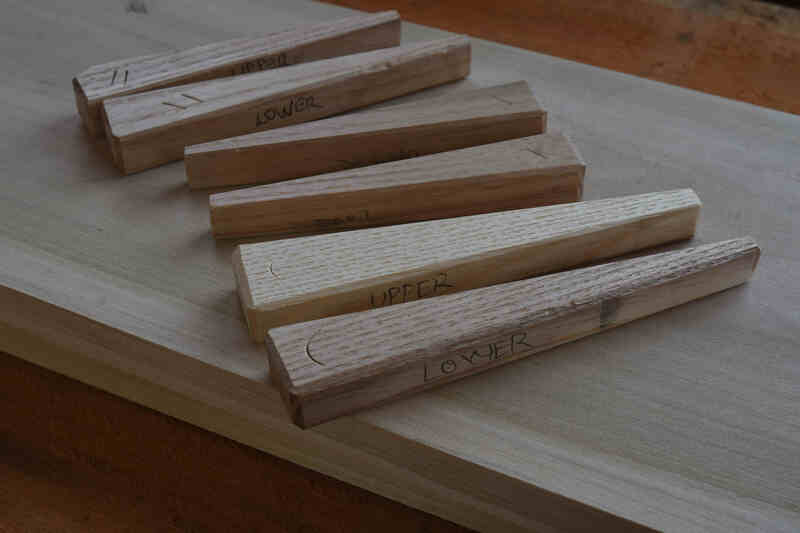 We don’t bang our shins on the protruding tenons, so stop right now second-guessing my use of that joint. 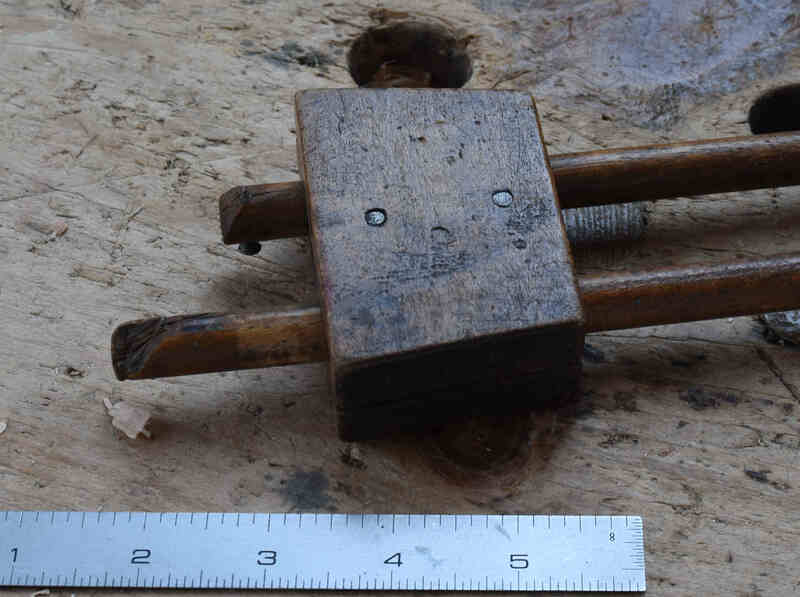 the two long rails, and eight wooden wedges. 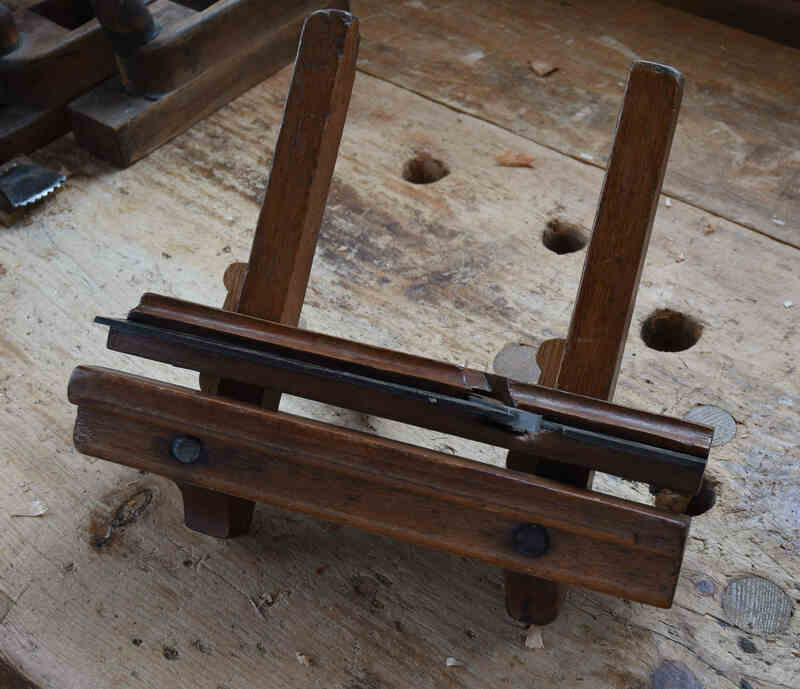 I made two cradles to help hold the long rails up while inserting the tenons. You only have to be able to count to two to ID the joints. 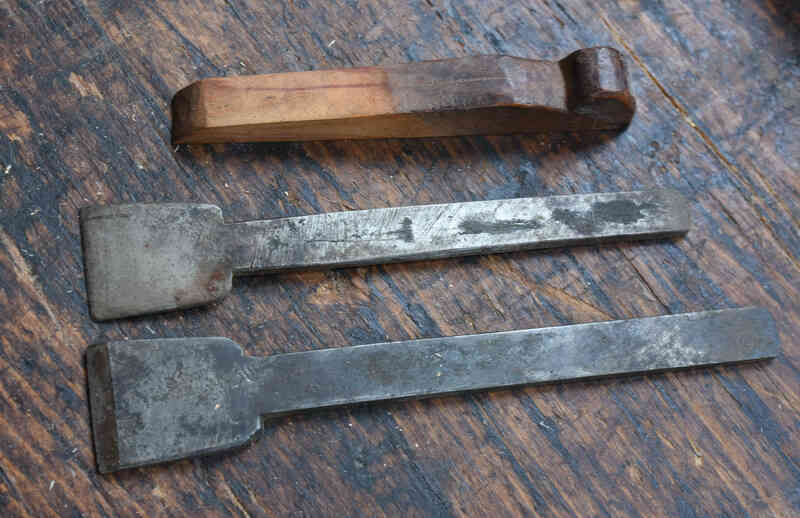 I, II and ) and )) cut with a chisel or gouge. Joint ) on the headboard’s post, and the corresponding rail. 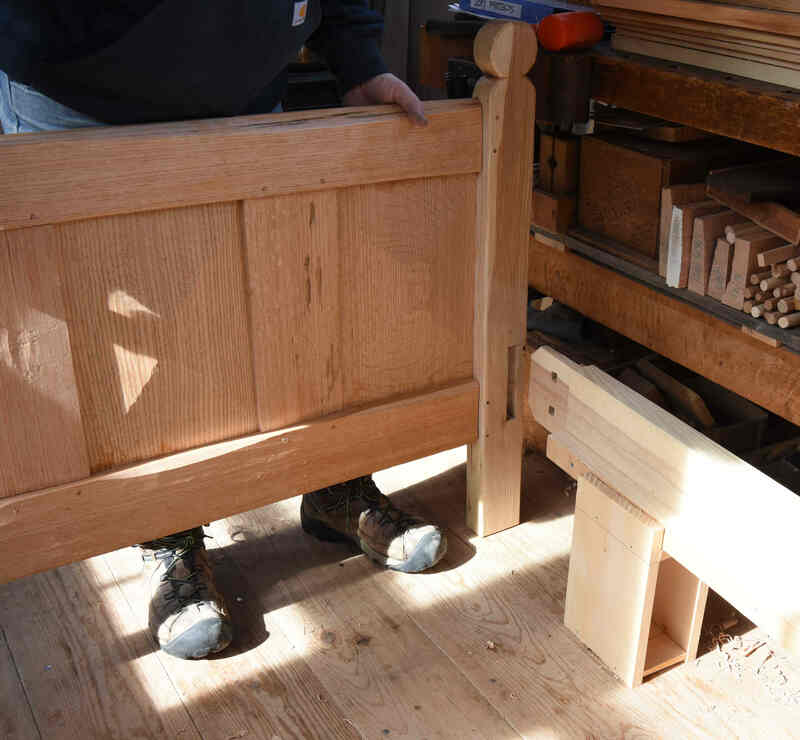 Set the far end of the rail in the cradle, then slide the tenon into the mortise. 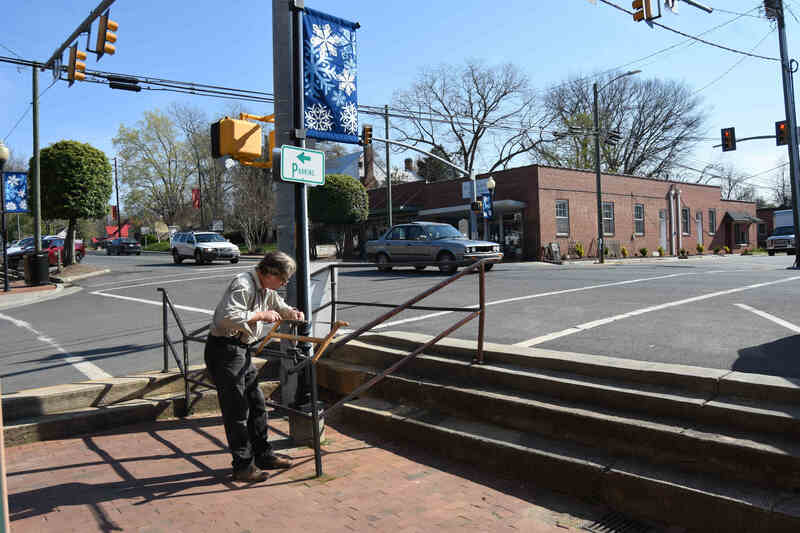 In the southwest, I bet the tenons will slide even more easily than they do here in the more humid northeast. If they get stubborn, there’s a dead-blow plastic mallet to knock the post onto the rail. Not vice-versa. 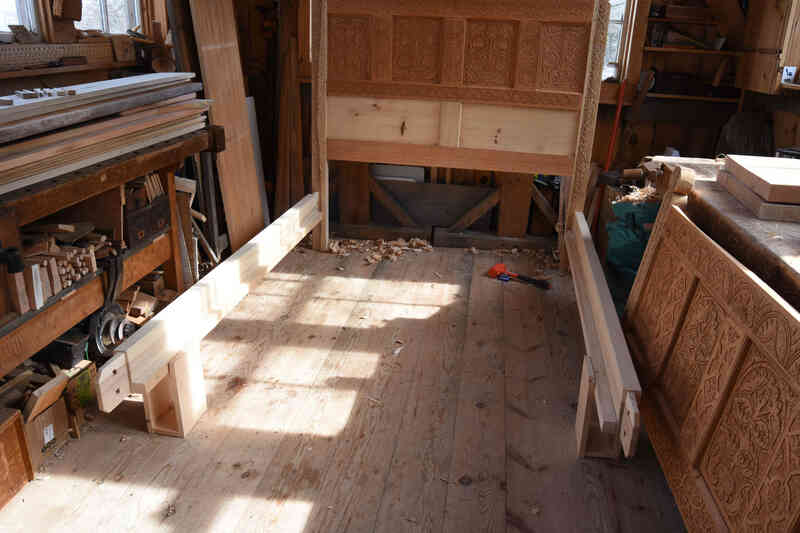 Once both rails are in the headboard, then get the footboard and slide it in place. The cradles hold the rails up just a bit off the floor, to make it easier to get in place. back and forth, use the plastic dead-blow mallet if necessary. 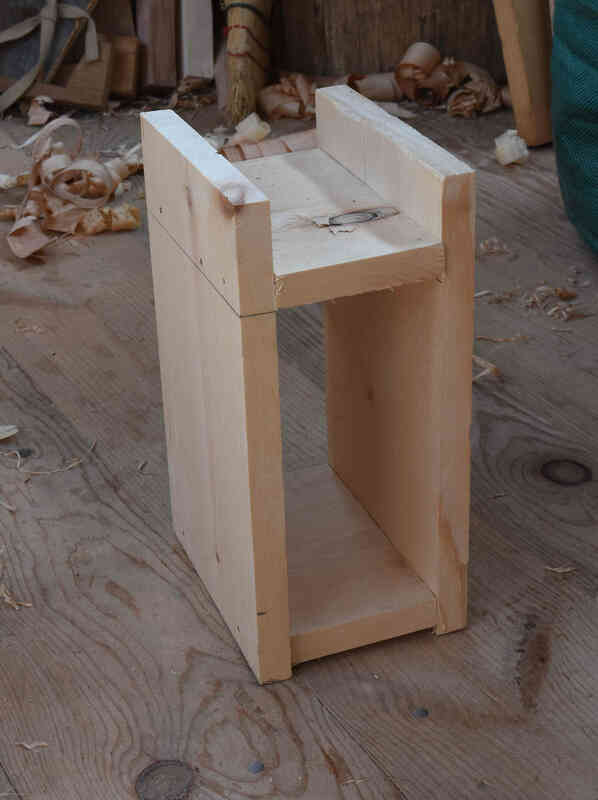 I alternate hitting above and below the tenon to move the post into place. Tap all eight wedges all around the bed. 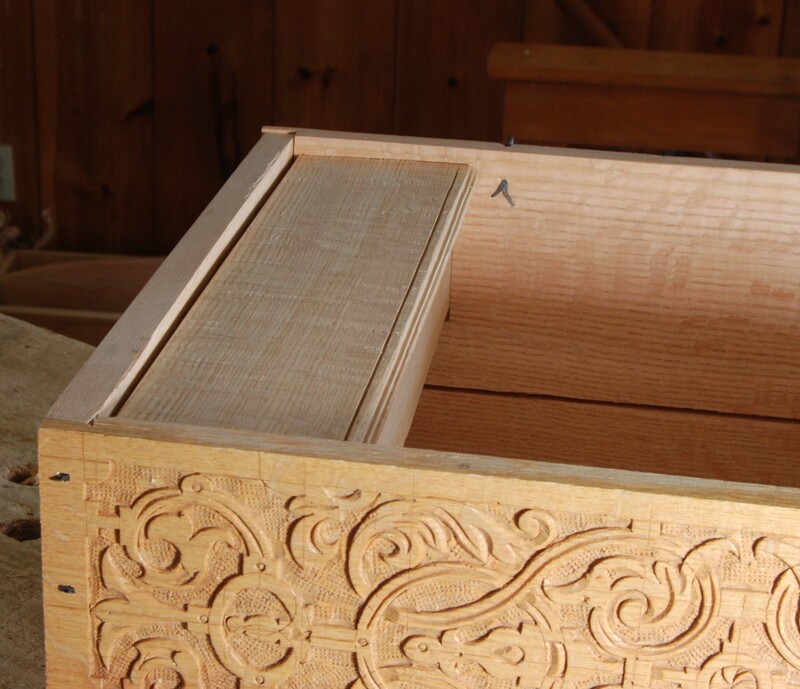 Then lift the footboard and knock the cradles out of the way. Throw them out. Or save them for reassembly sometime if you move. 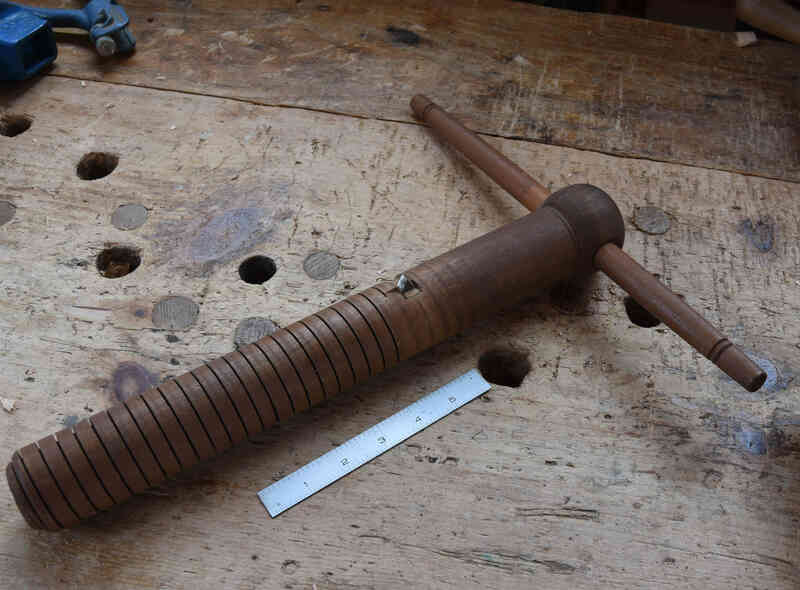 Same with the mallet – I don’t want to see it again. 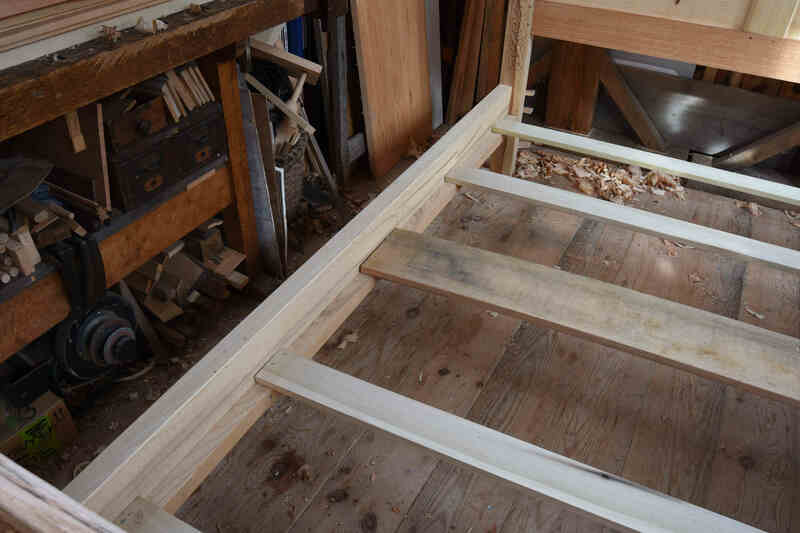 Now the real modern junk – a series of five slats across ledgers inside the bed. These get screwed down; probably don’t need to be fastened, but it doesn’t hurt. the ugly bits. You only see them when you move. I numbered them in pencil 1-5; one at the head, 5 at the foot. You’ll see scribe lines outlining where they go. 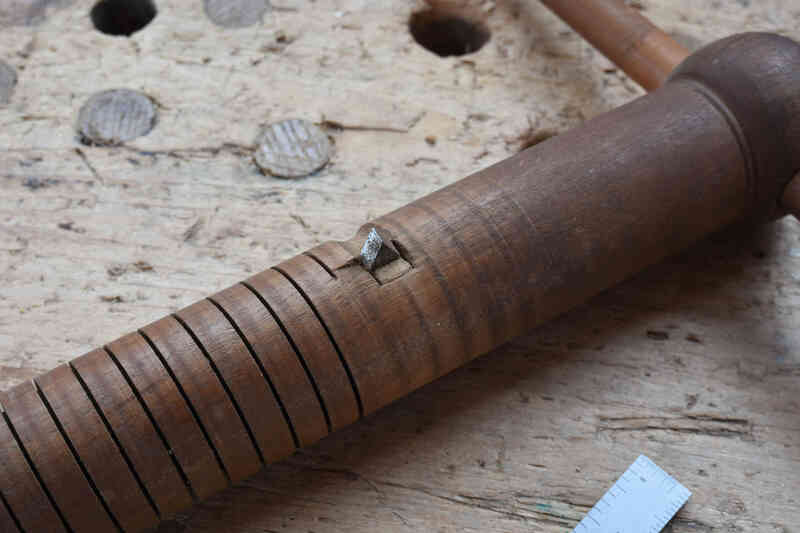 Apply some beeswax or soap to the screw threads if they aren’t going in easily. 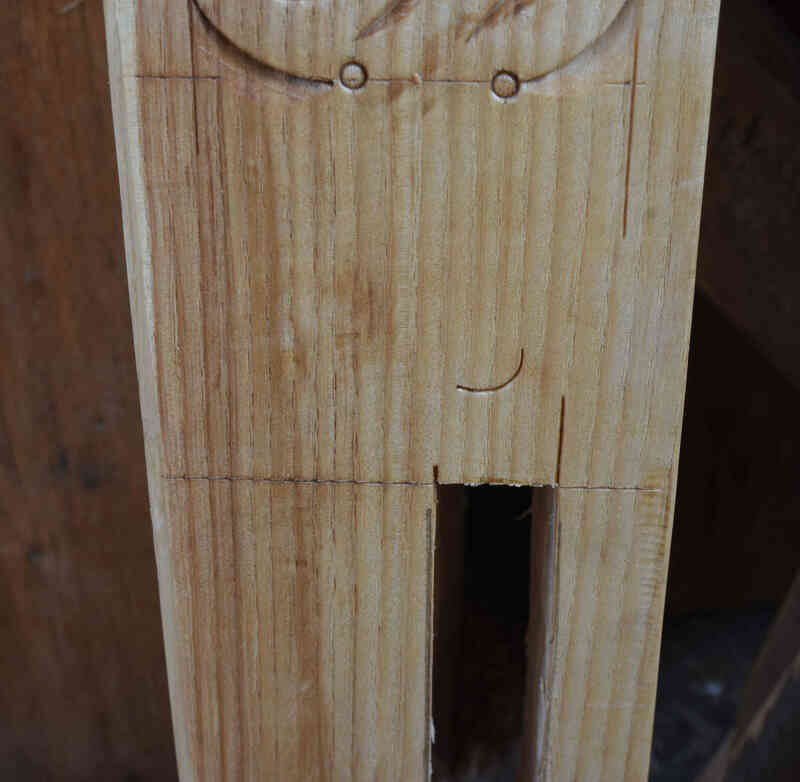 I start the screw in the slat until it pokes through, then I can find the hole it goes in easier. 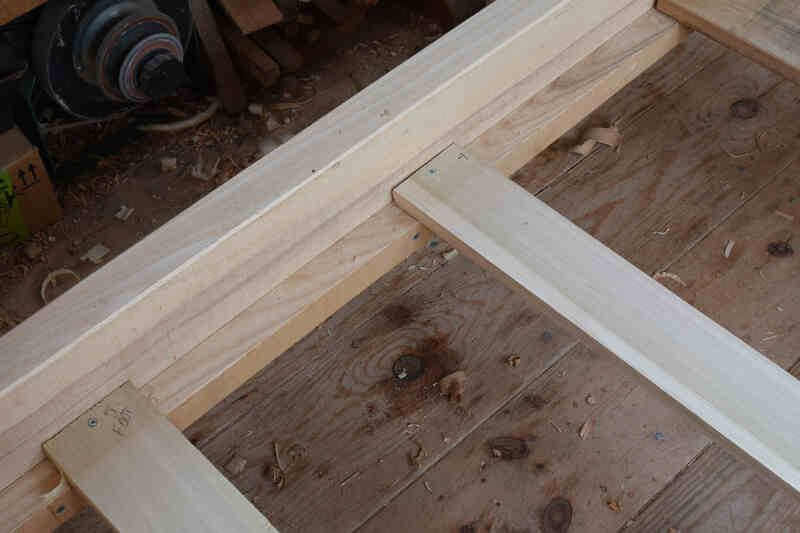 This step is one thing I worry about, that the holes will close up as the timber dries further down there. I tried to make them generous. You can see the numbering if you click the photo to enlarge; they’re numbered on the slat, and on the ledger they sit on. Just on one side of the bed. The stick your bedding in place. I hope it fits right. here it is as a slideshow/video – a little too quick on the captions, but there’s a pause button. I have little video-making tolerance.